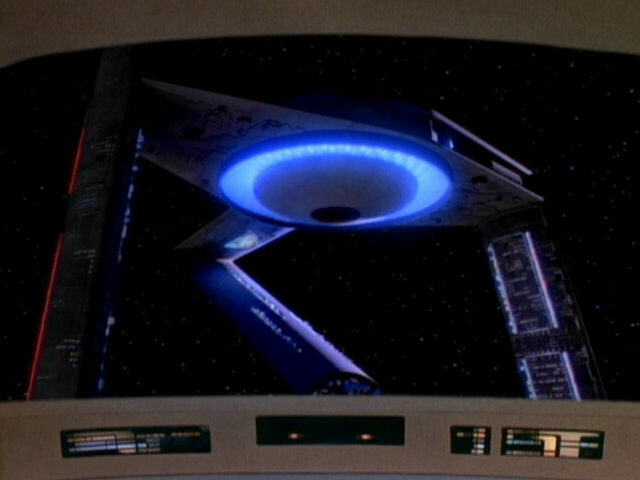 Ex Astris Scientia - Observations in TNG: "Conundrum"
Here are some observations about sets, props and visual effects in TNG: "Conundrum" without a specific theme, and a comparison of the original TV release (TNG) with the remastered episode (TNG-R). 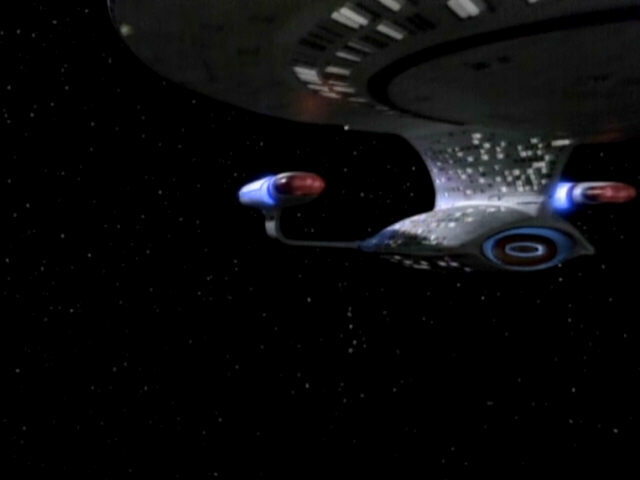 The USS Enterprise-D drops to impulse at the beginning of the episode. 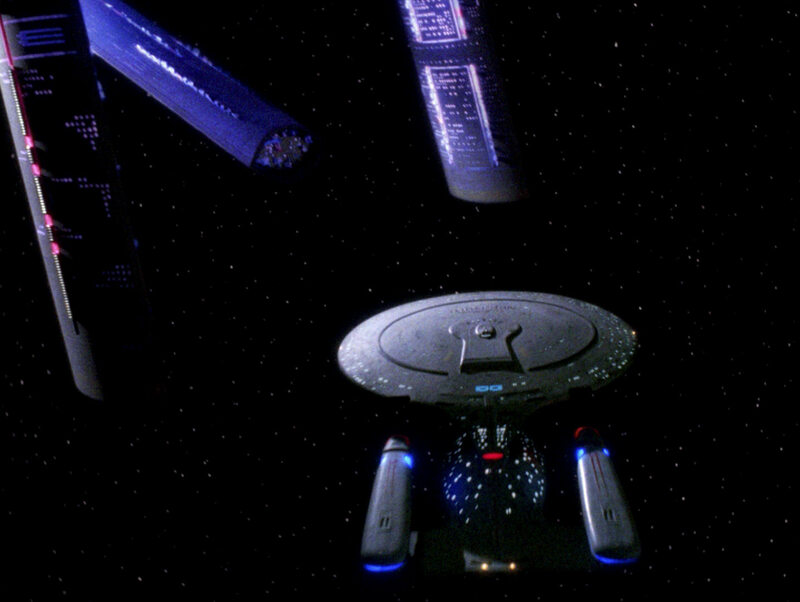 Enterprise Flybys in TNG and TNG-R As the original footage of the model could not be found for the remastering, the shot had to be recreated using a CG model of the ship. 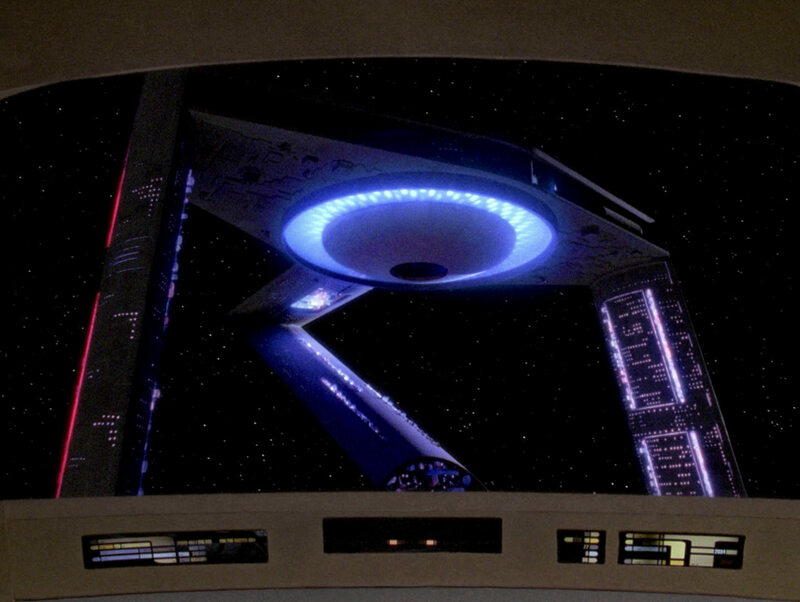 While the new detailed CG model of the ship, created by CBS-Digital, debuted in the warp drop sequence in "Ensign Ro", "Conundrum" is the first episode in which also the impulse and warp flybys were recreated using the new CG model. 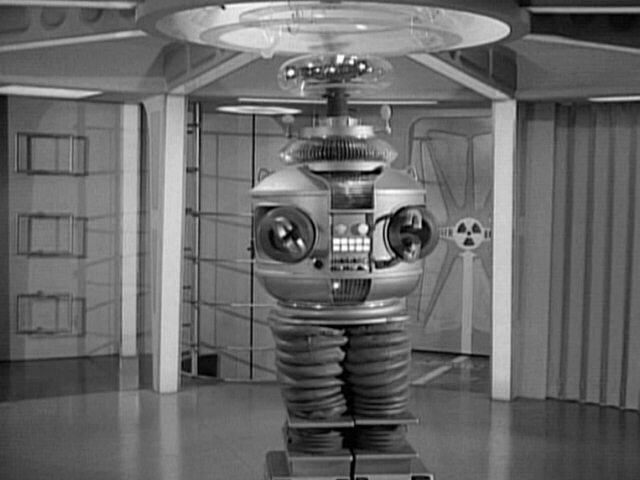 The large chess piece in the first screenshot looks similar to the robot from the 60s science fiction show "Lost in Space". 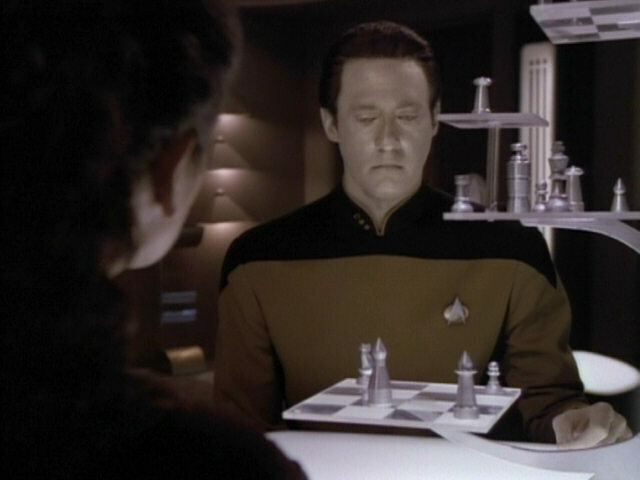 In the second screenshot, two chess pieces are seen, whose top looks like the Jupiter 2 spaceship from the same series. 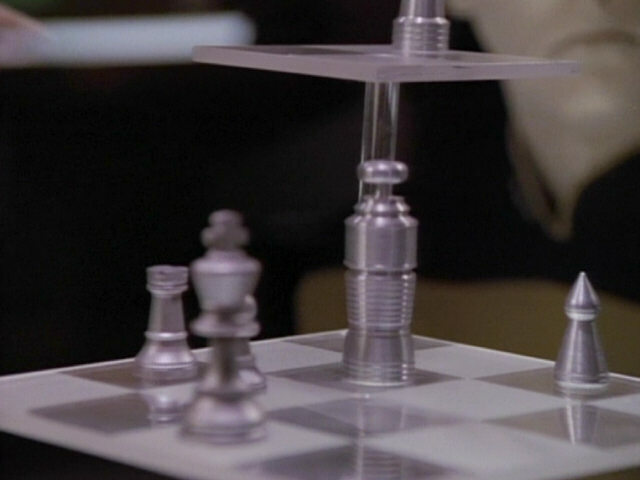 Lost in Space A better look at the chess pieces in HD. 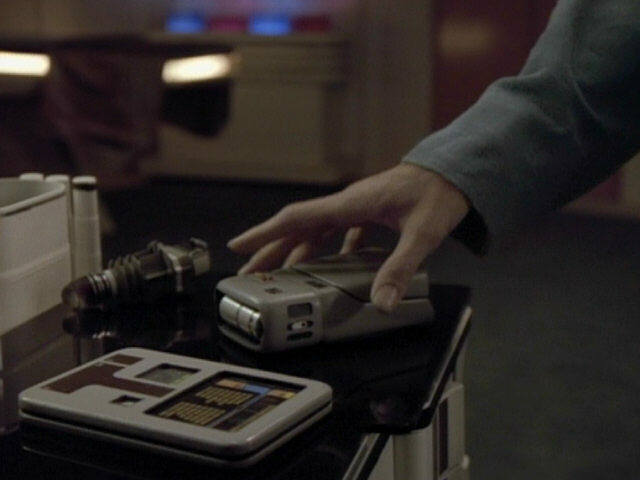 A close-up of a PADD, a medical scanner and the medical tricorder used in season 5. 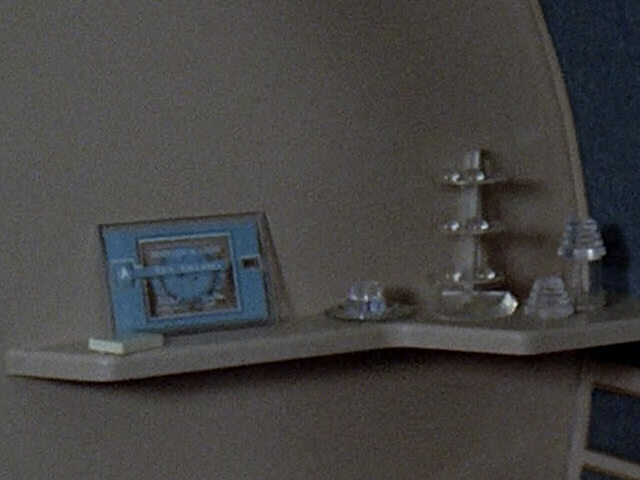 HD close-ups of the props. 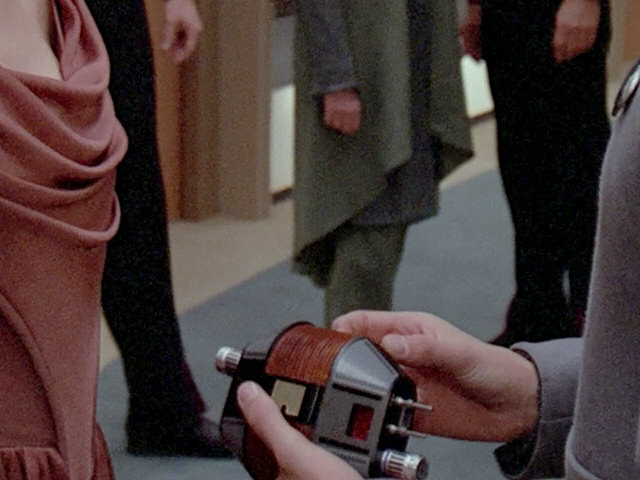 The medical tool Crusher uses in this scene was originally created for "The Most Toys". 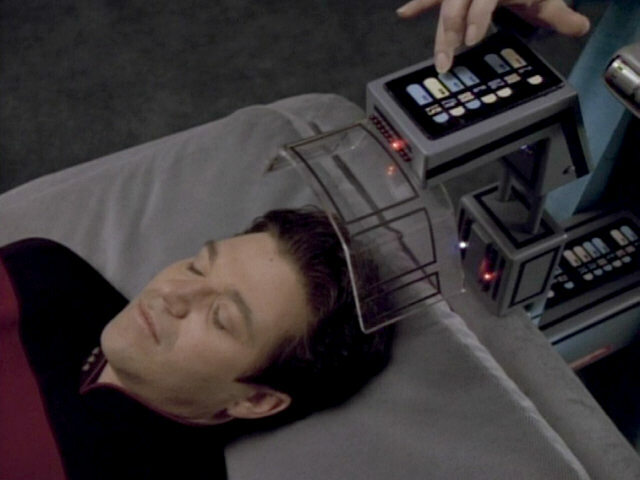 In that episode, Kivas Fajo used the device to control his personal force field. 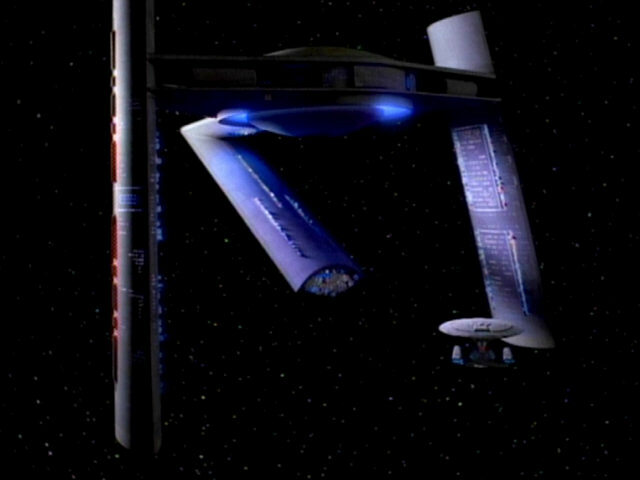 The Satarran starship is a re-use of the Pakled ship Mondor, which appeared in seasons 2's "Samaritan Snare". 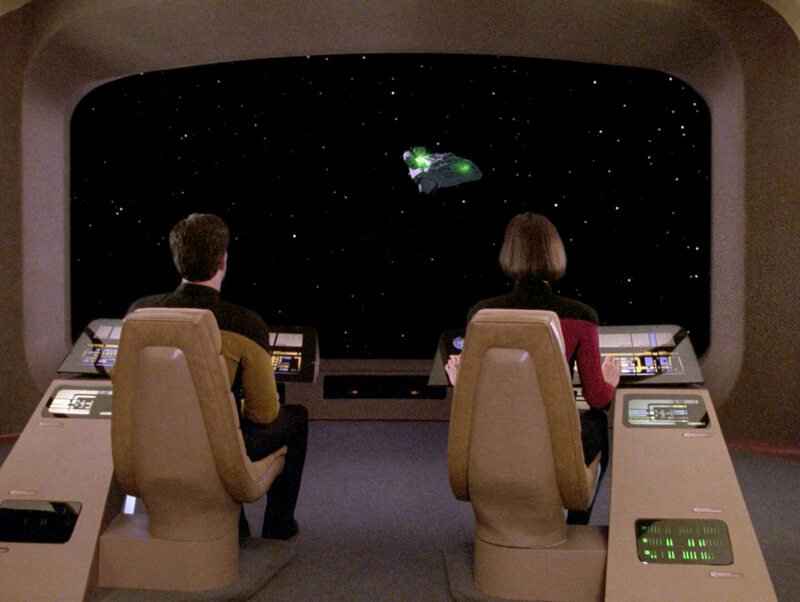 Redresses of the Mondor Like in the SD version, a green light was added to the ship, distinguishing it from the Mondor. Data makes a Samarian Sunset for Troi, doing it "the traditional way". 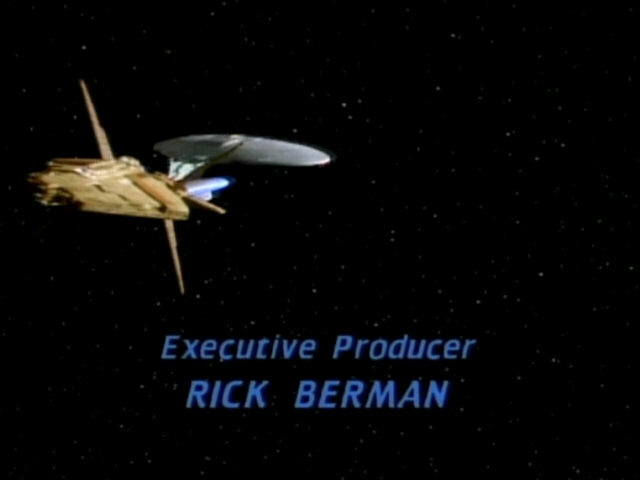 The color swirl was added in post production. 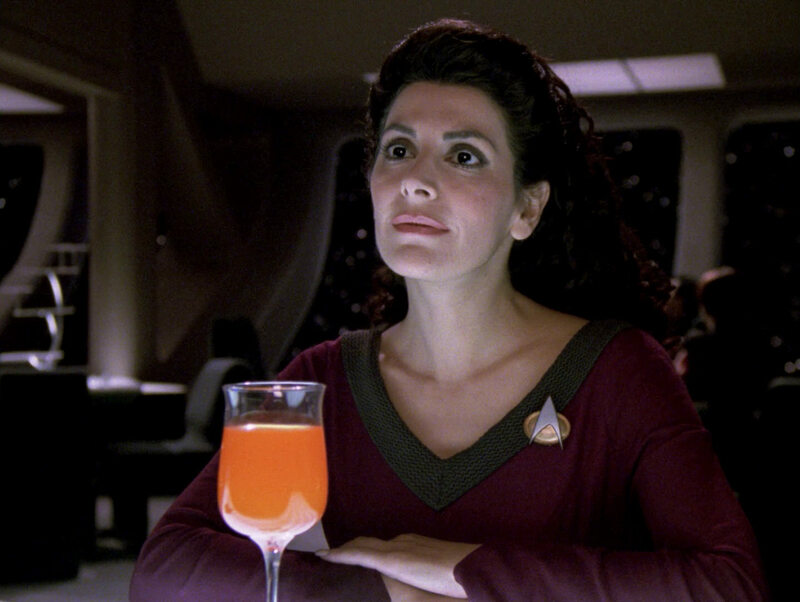 In the second and third shots, the orange color of the drink was added in post production, as the liquid in the glass was transparent on set. 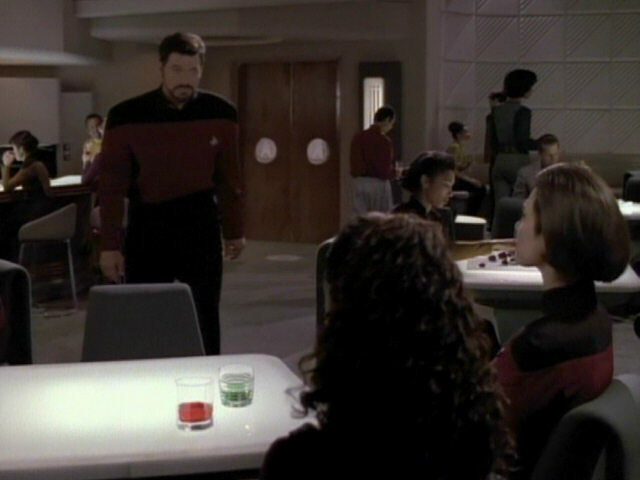 In the fourth screenshot, the white drink was replaced with an orange drink on set. 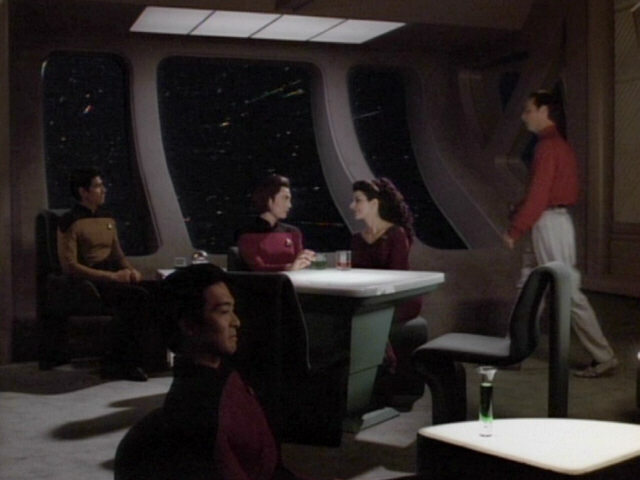 Comparing the last two screenshots, one can see how the color was added in post production, as the third screenshot features a wider transparent rim of the glass. 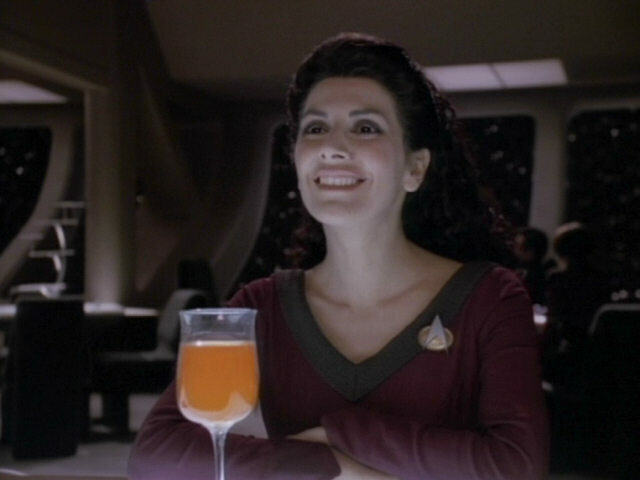 It is also of note that screenshots 2 and 3 show the same footage of a smiling Troi, as the same material was used twice. The only difference is the orange color in the glass, which was added in post production twice. 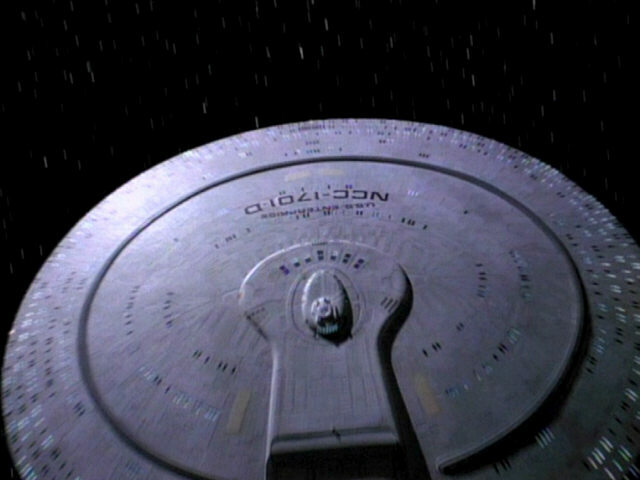 The reconstructed effect in TNG-R. 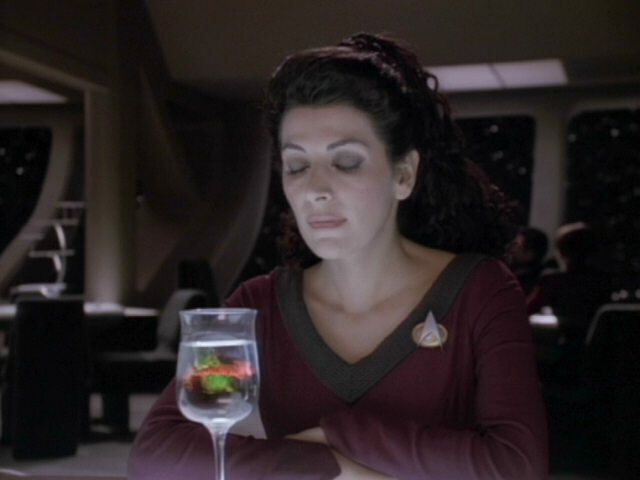 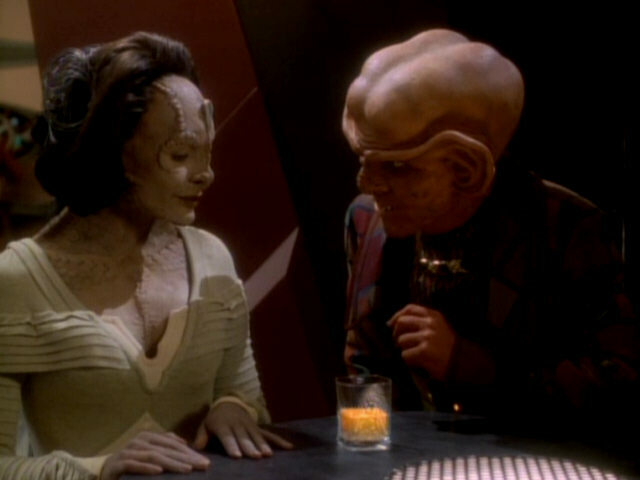 The same drink with the same transformation effect appeared later in the Deep Space 9 episode "Profit and Loss". 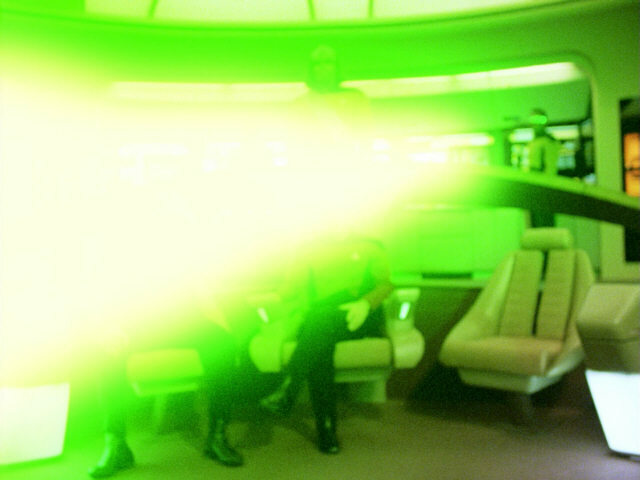 The effect of the Satarran scanning beam was added in post production. 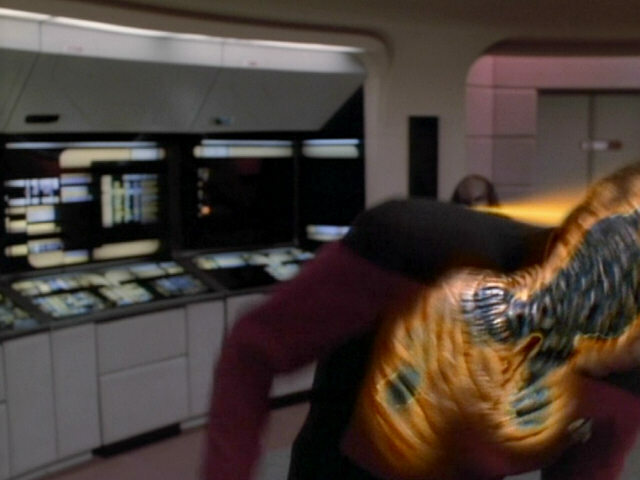 The effect in TNG-R. 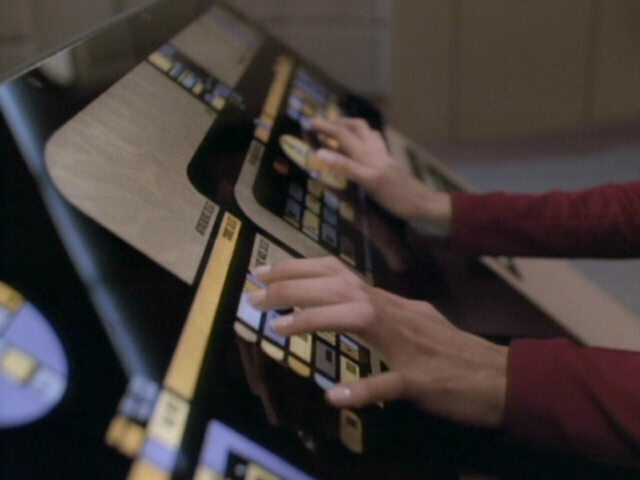 The conn console can be seen up close in this screenshot. 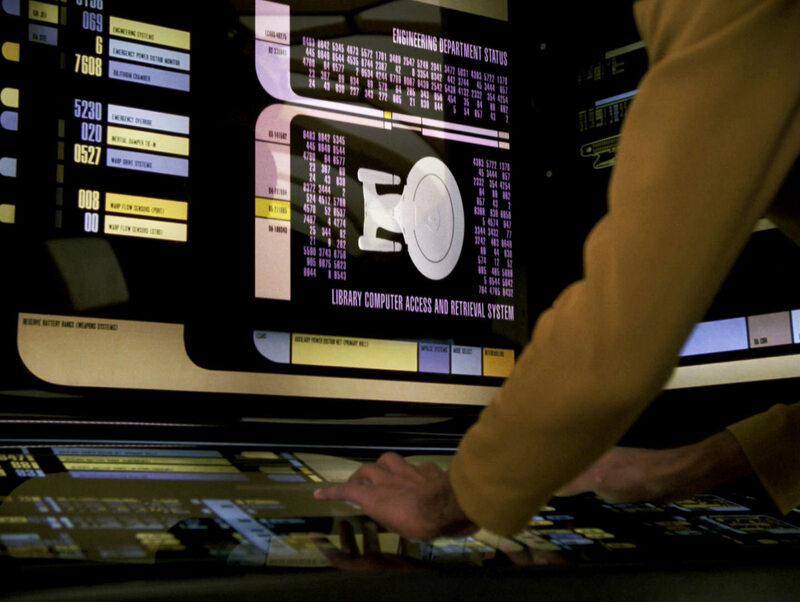 We can't see more details of the console in the HD shot. 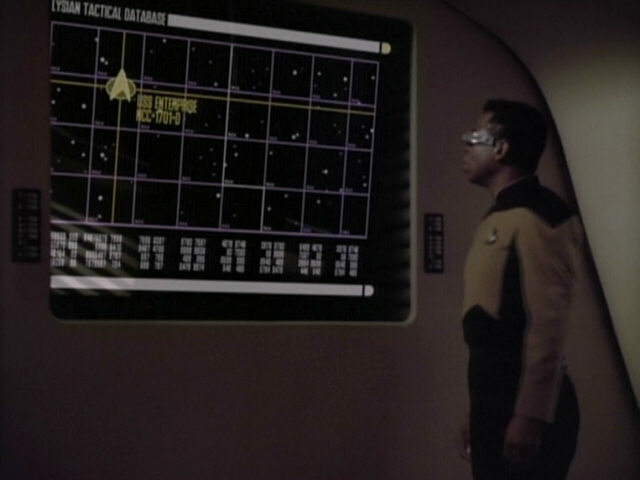 A star in the proximity of the Epsilon Silar system can be seen on the main viewscreen in this shot. 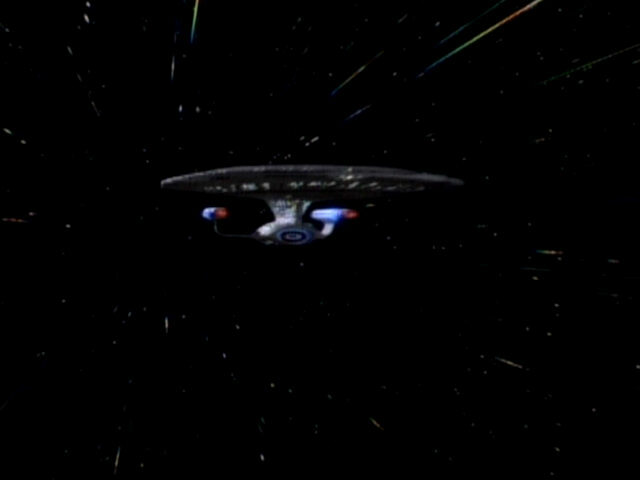 This shot is exceptionally noisy even in HD. 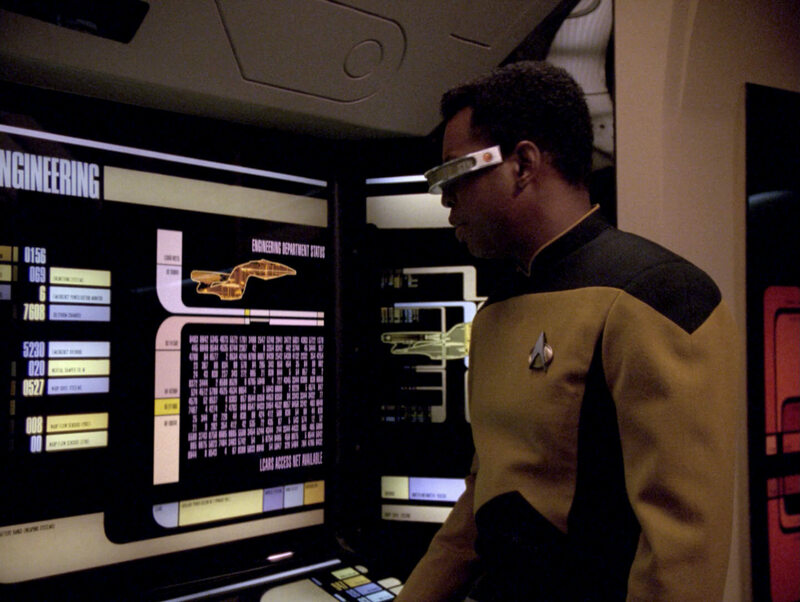 The graphics in this scene were all added in post production. 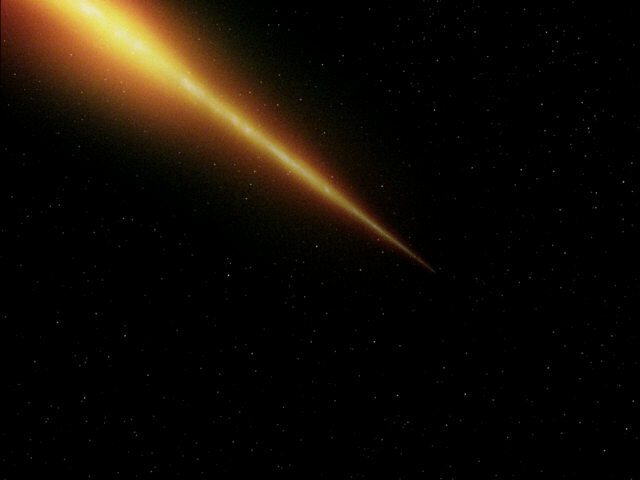 In SD, the text cannot be read. In HD, everything is legible. 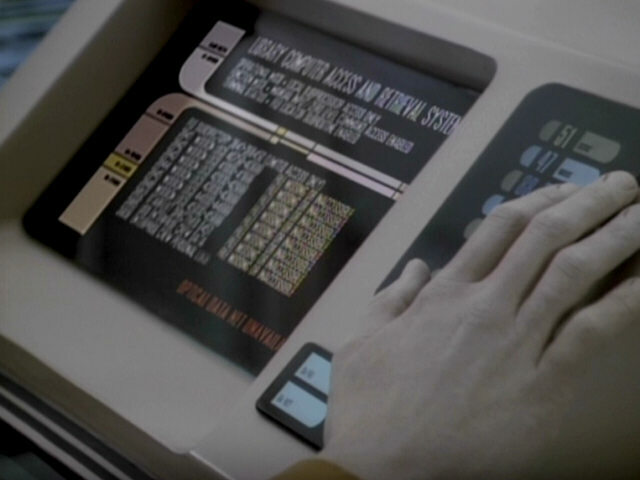 It can be made out now which systems are online and which are offline. 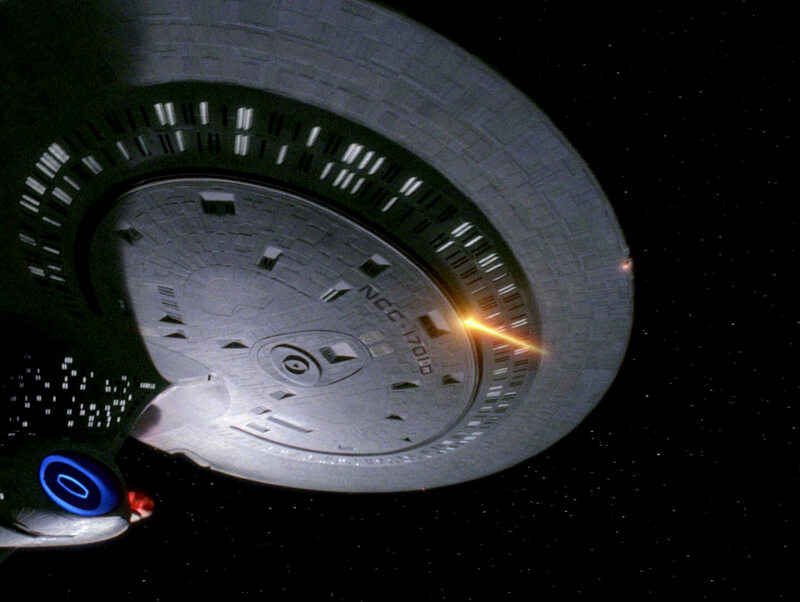 In contrast to the previous scene, this graphic of the USS Enterprise-D was not added in post production. 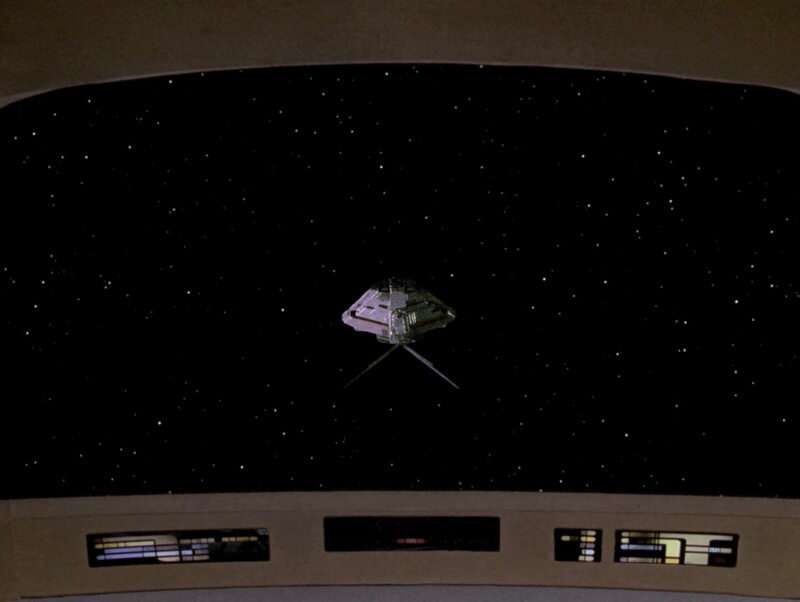 The apparently unchanged graphics in HD. 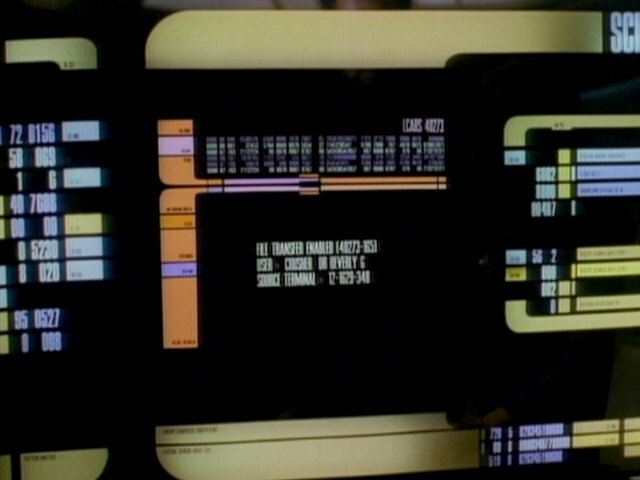 The graphic displayed on the engineering monitor was changed between seasons as a screenshot from the season 4 episode "The Nth Degree" illustrates. 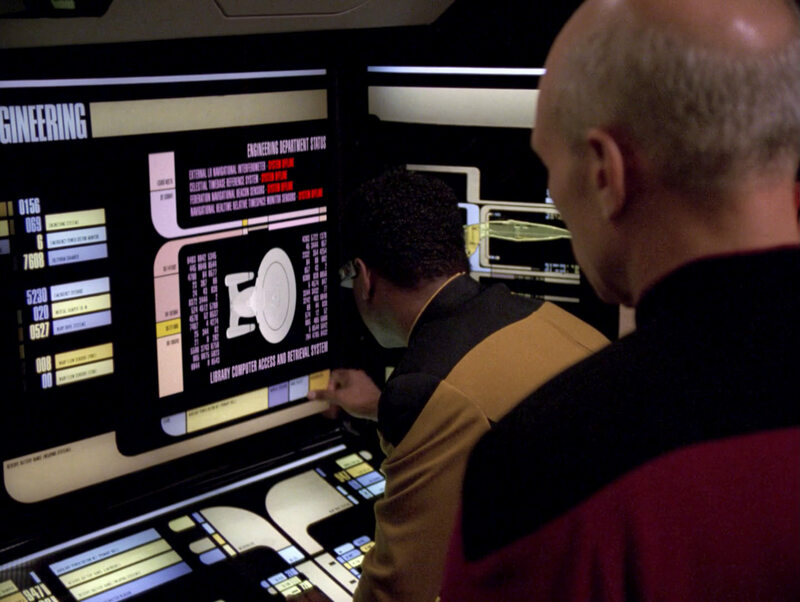 It seems as if not only the colors were changed but also as if the two different side views of the USS Enterprise-D displayed by the two wall consoles were switched. 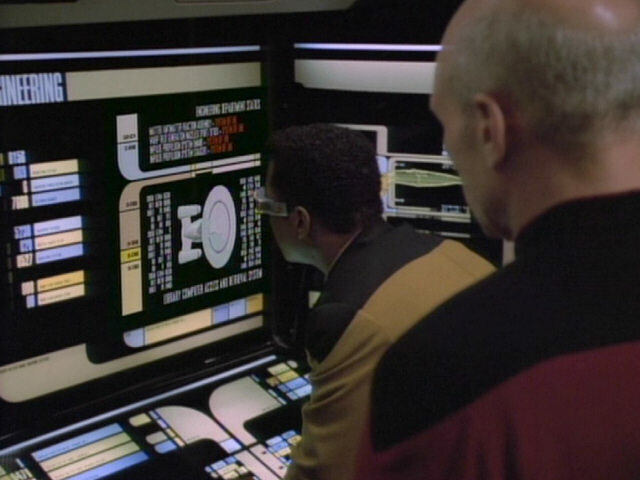 The desktop monitor in the ready room displays the same graphic as the aft bridge station seen a few moments ago. An HD close-up of the monitor. 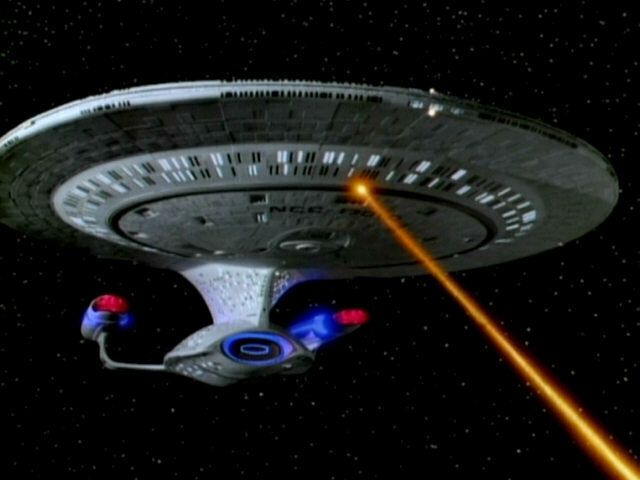 The USS Enterprise-D fires into space. 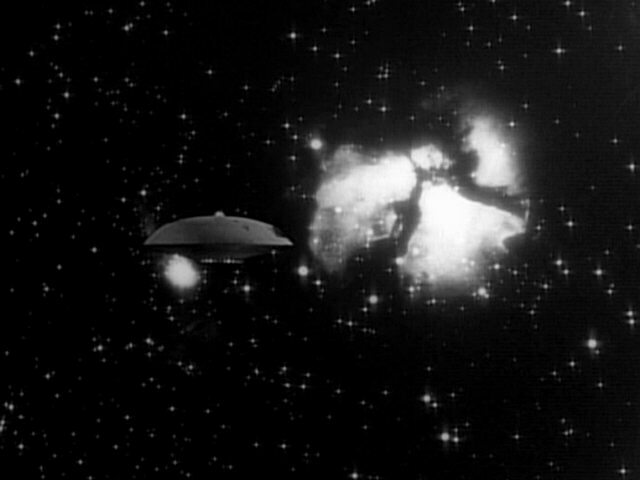 The same footage also appeared in "Legacy" and "A Matter of Time" where the ship is seen firing at a planet surface. 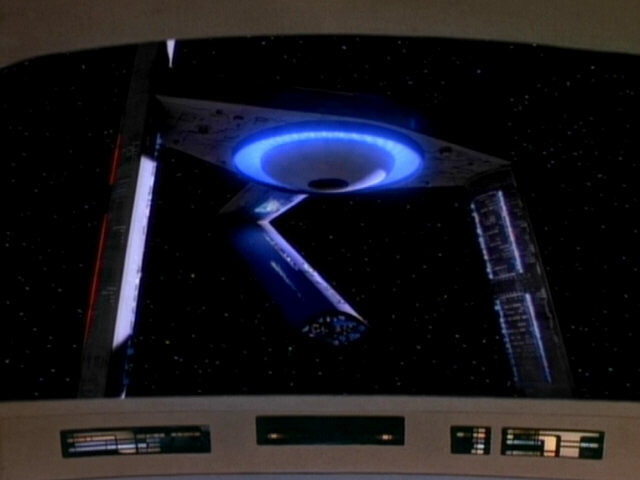 "Legacy" In TNG-R, unlike in the original episode, the shot of the forming phaser beam is cut off before the left and the right energy pockets have joined to one phaser beam. 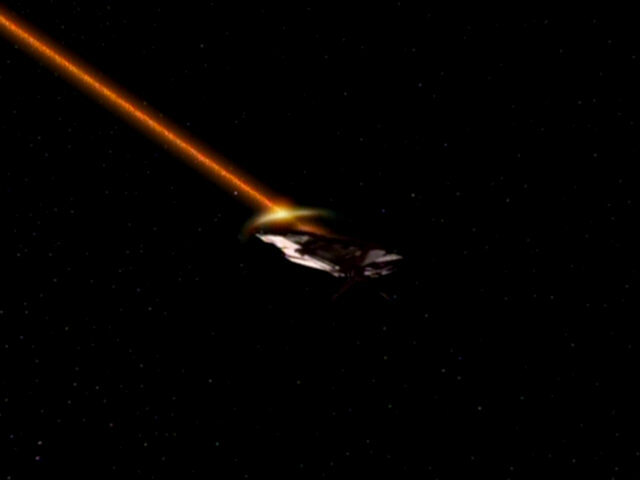 The following shot is just as in the original episode: We can see how the beam travels through space. 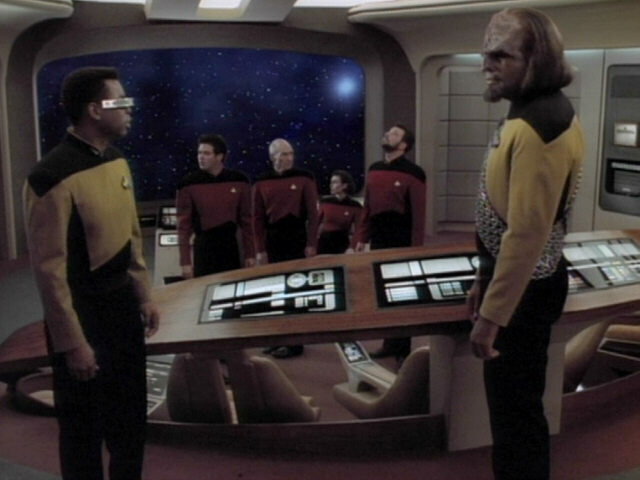 The dark lower border of filming equipment is barely visible above Worf in this screenshot. 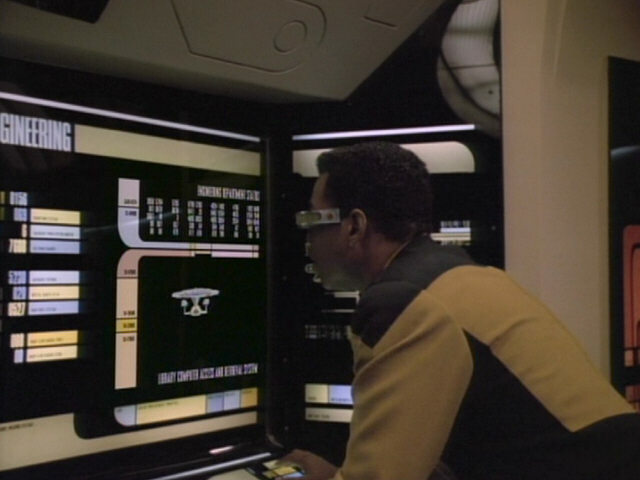 No equipment is visible in the remastered episode. 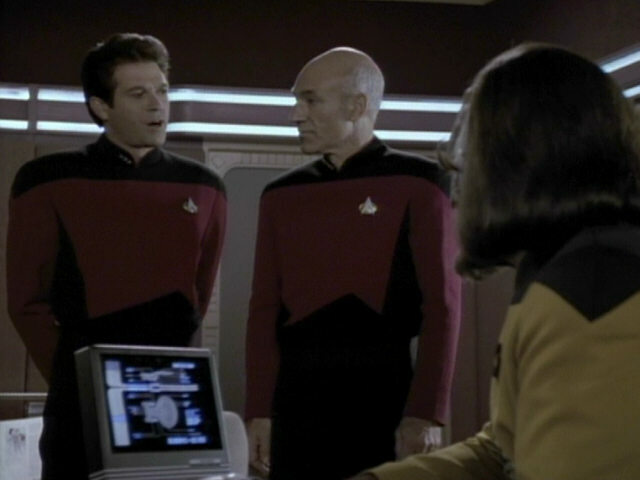 The personnel files of Picard, MacDuff, Data, Crusher, Troi and Ro can be seen in this series of screenshots. 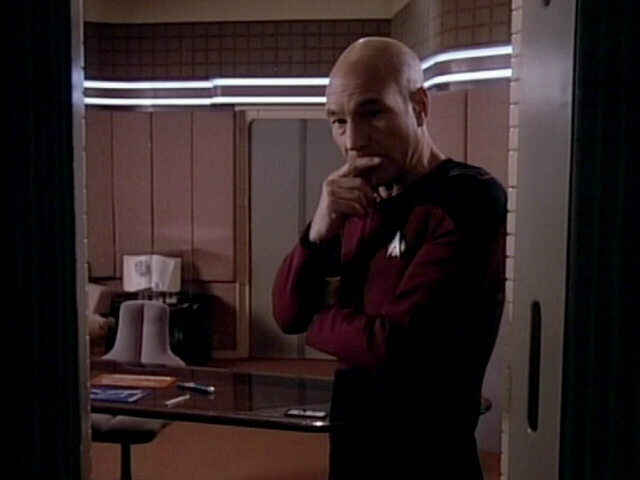 Like all other personnel files in the original episode, Picard's file contains some basic data but no Starfleet serial numbers. 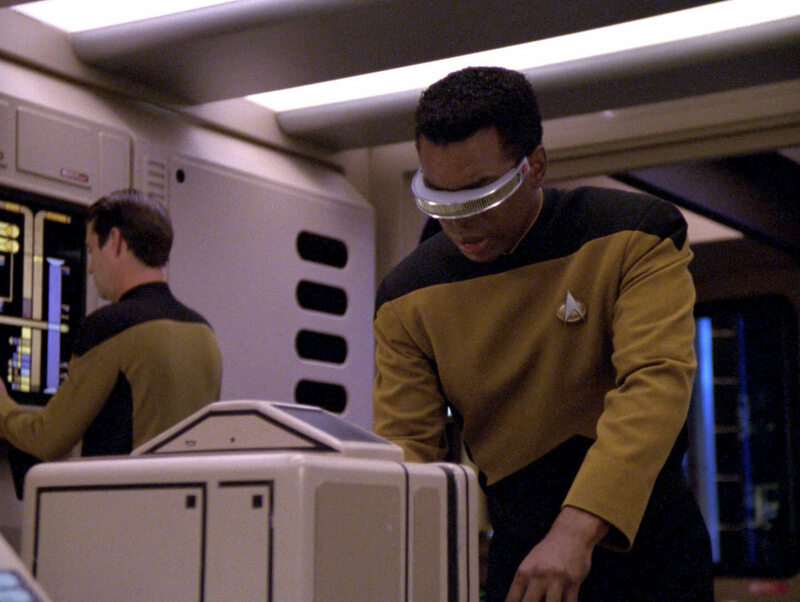 The files were recreated from scratch for the remastering of the episode, making it possible to fix some mistakes (and sadly also introduce some new ones) and add some details. All personnel files now include the Starfleet serial numbers of the officers in question. 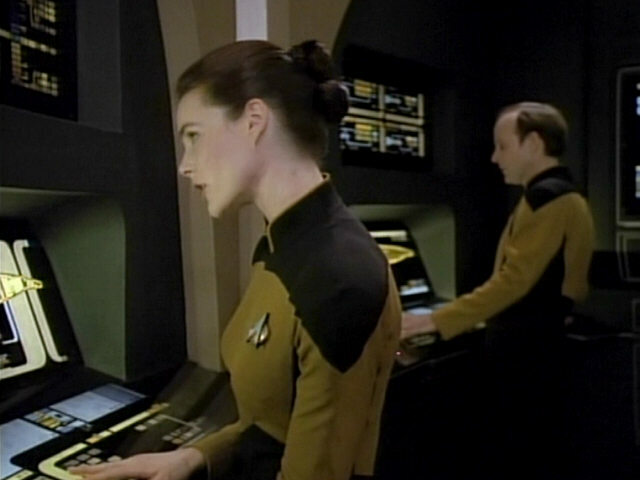 It seems the original photos in the files could not be located for the remastering so the SD footage was used instead. 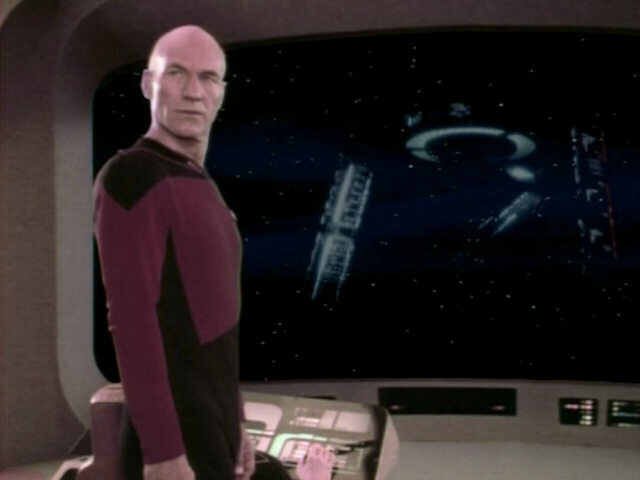 Only Picard's portrait seems to have been found and thus appears much clearer. 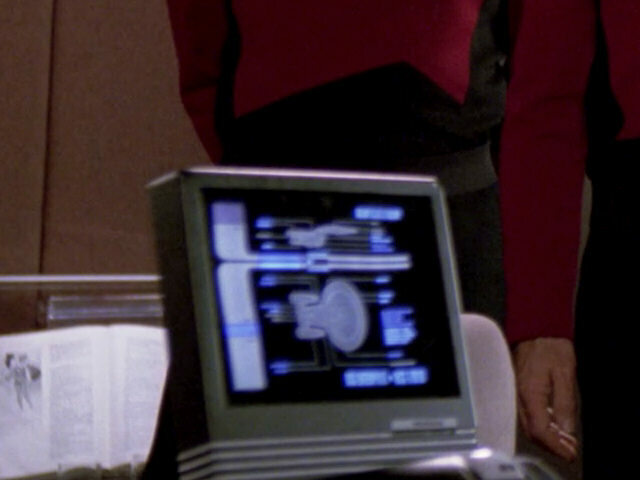 Picard's new serial number doesn't match the one read out by Gul Madred in "Chain of Command I". 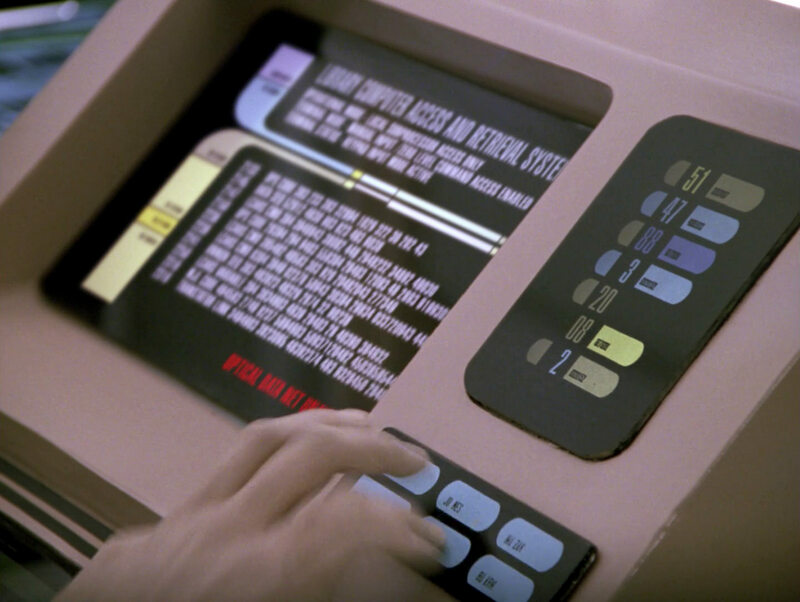 In that episode, his serial number is "SP-937-215", while here it is listed as "TD-1037-2176 (CEO)". 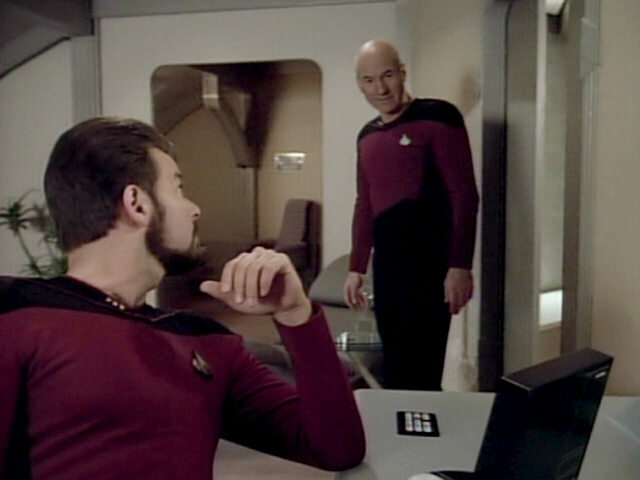 Additional new notes about Picard include his serving as Klingon Arbiter of Succession and a mention of his cardiac replacement surgery. MacDuff's first name is listed as "Keiran" in the SD version. 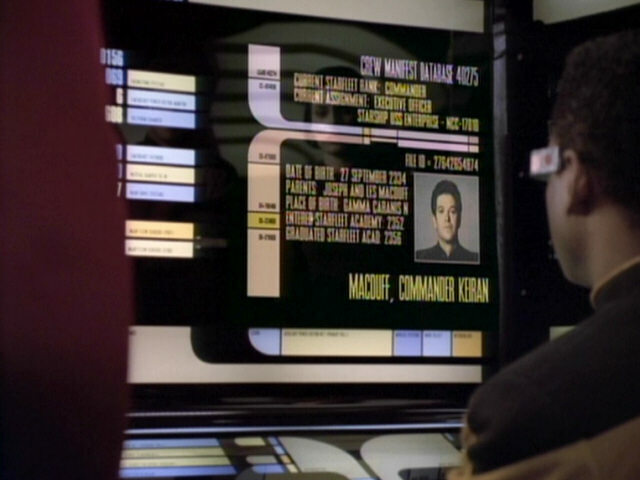 The biggest change is the spelling of MacDuff's name. 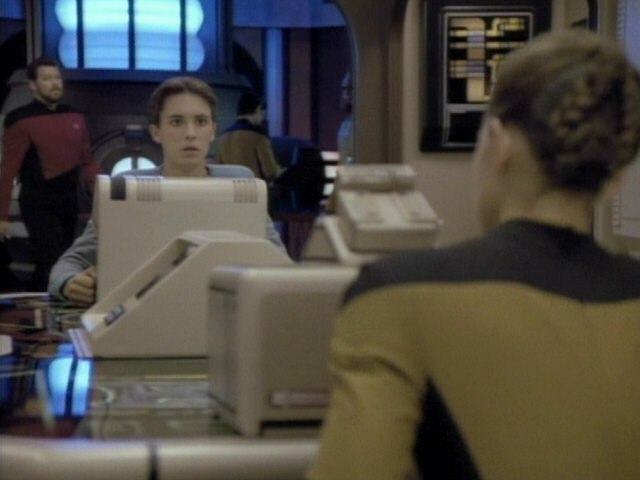 His first name is no longer "Keiran" (as per the script of the episode) but Kieran. 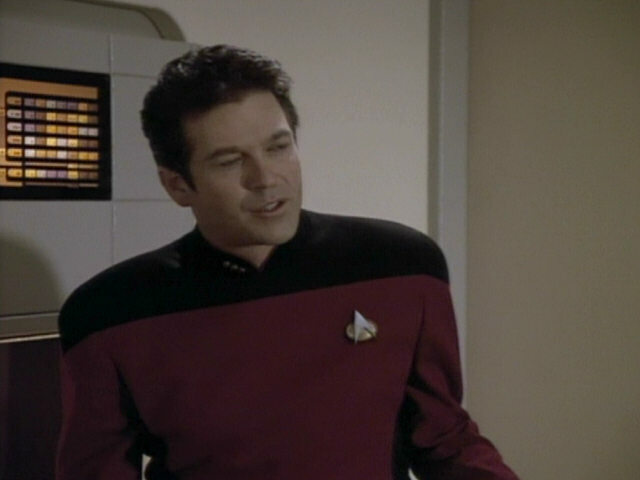 His years at Starfleet Academy were changed from 2352-2356 to 2357-2361. 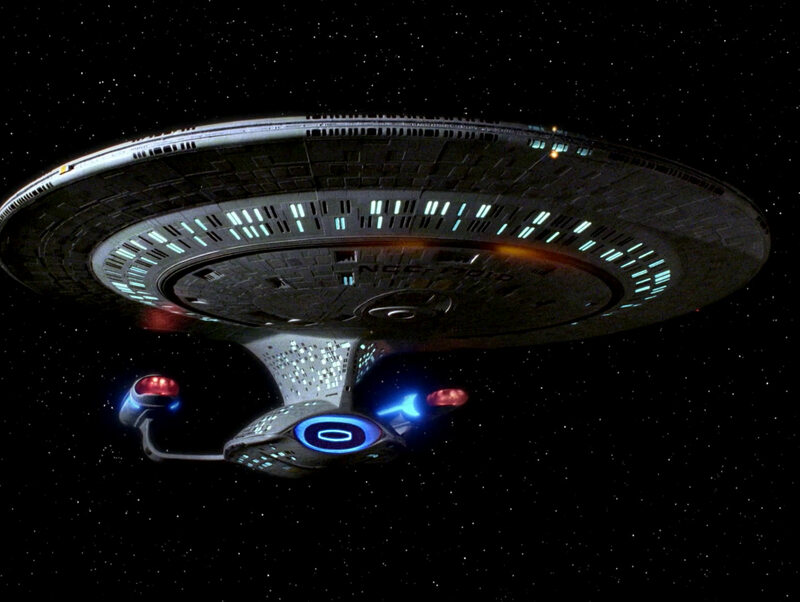 His file now lists a new ship he previously served on, the USS Orion. 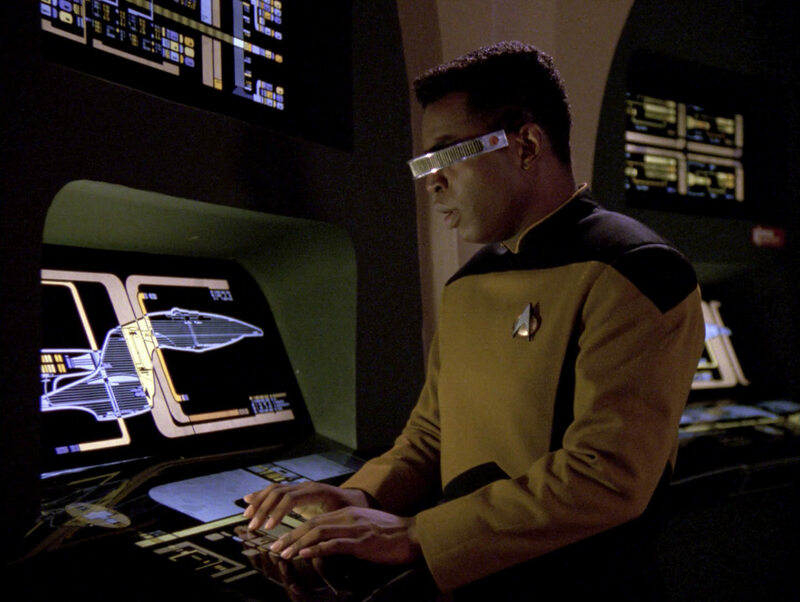 On that ship he served as operations manager. 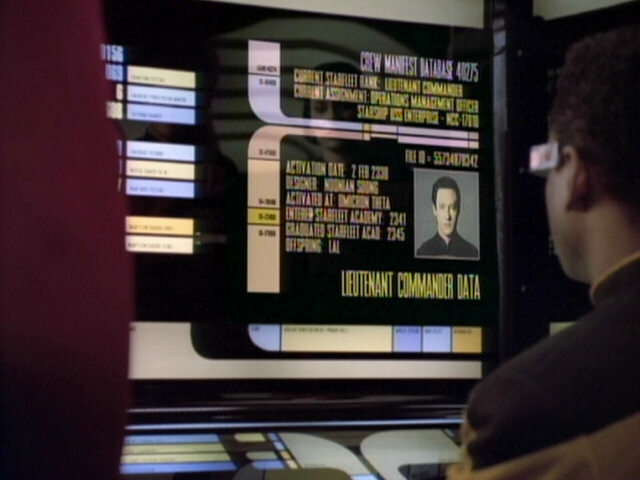 Data was activated in 2338, according to the SD version of the episode. 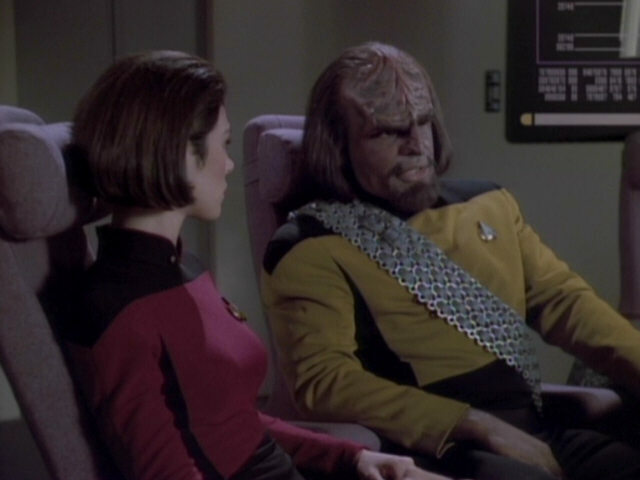 His creator's name is given as "Noonian" instead of "Noonien". 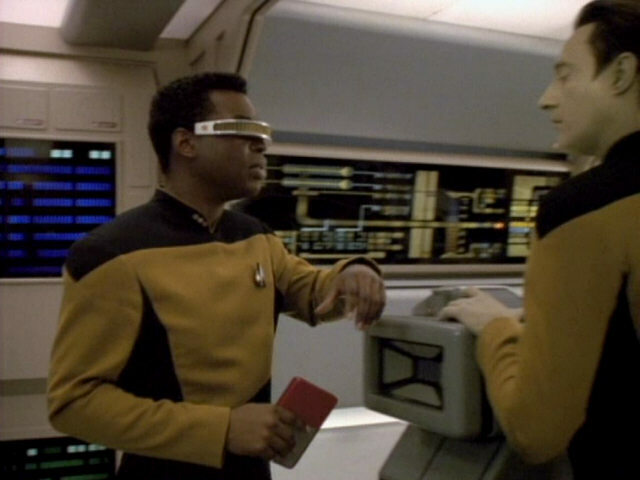 The year in which Data was activated is erroneously given as 2238, one hundred years earlier than he was really activated. 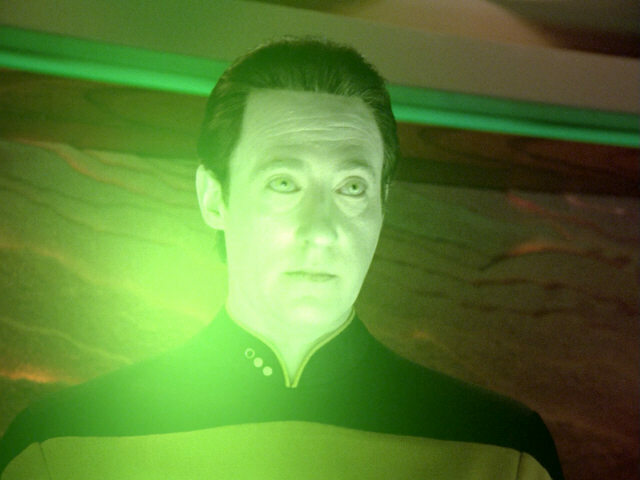 The name of Data's creator is spelled "Noonien" now. 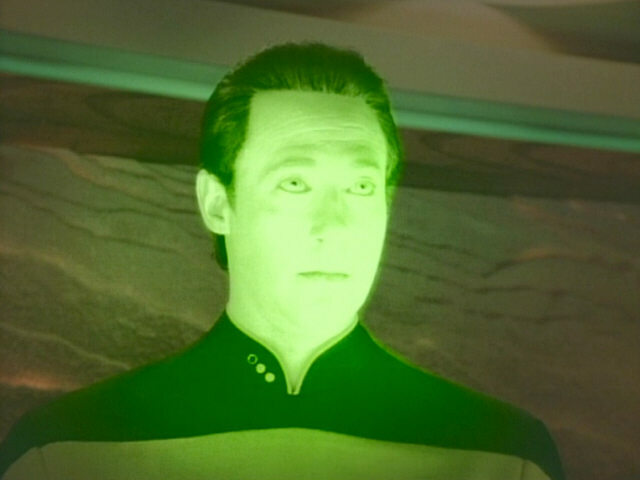 Data's place of activation, Omicron Theta, is called "Omicron Theta Colony" now. 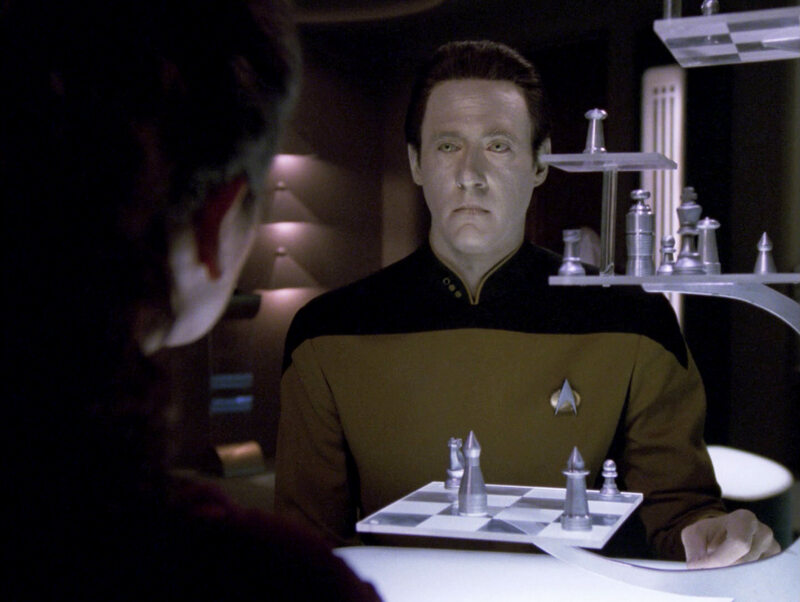 One new fact about Data is his major field of study, probability mechanics. 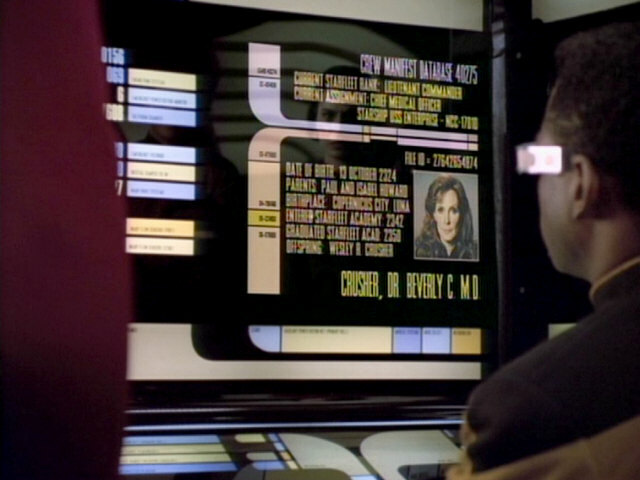 Beverly's middle initial is "C" (presumably for "Cheryl"), although it was "G" (for "Gates") in "Sins of the Father". 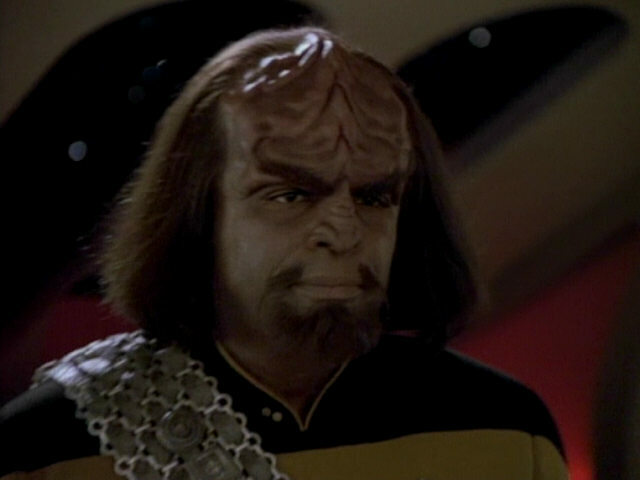 the Father" Crusher's personnel file appears mostly unchanged, only the line "Fellow, Acad. 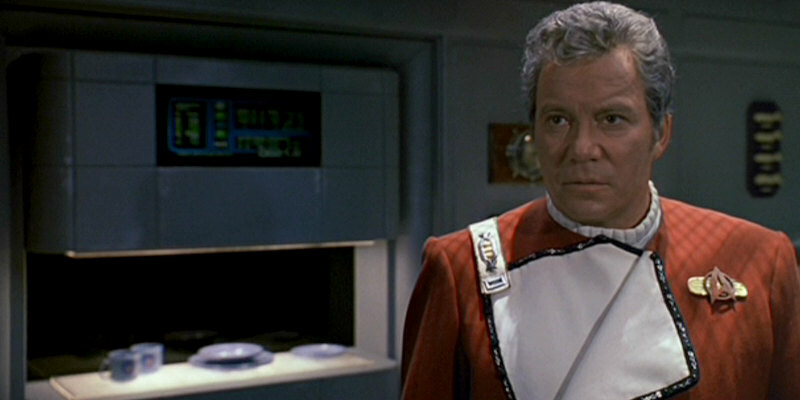 of Starfleet Surgeons (Sol Chapter)" was added. 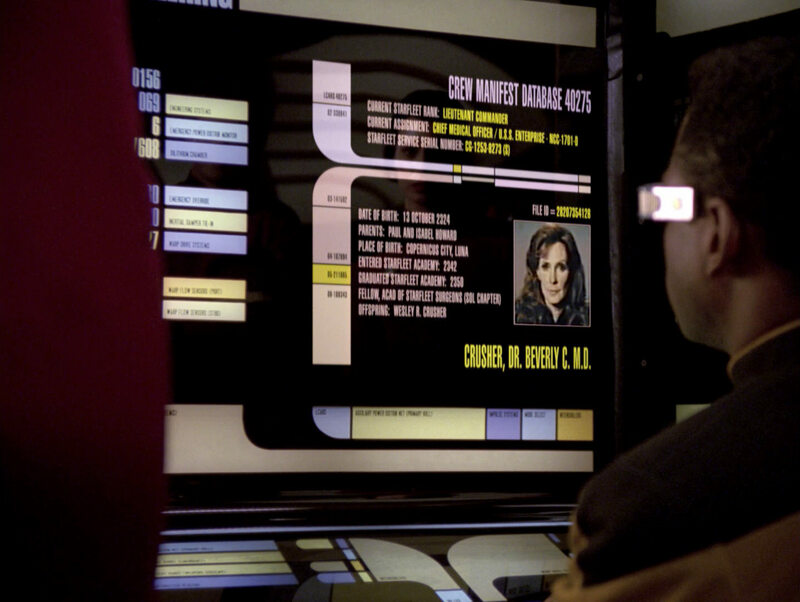 Her initial is still listed as "C". 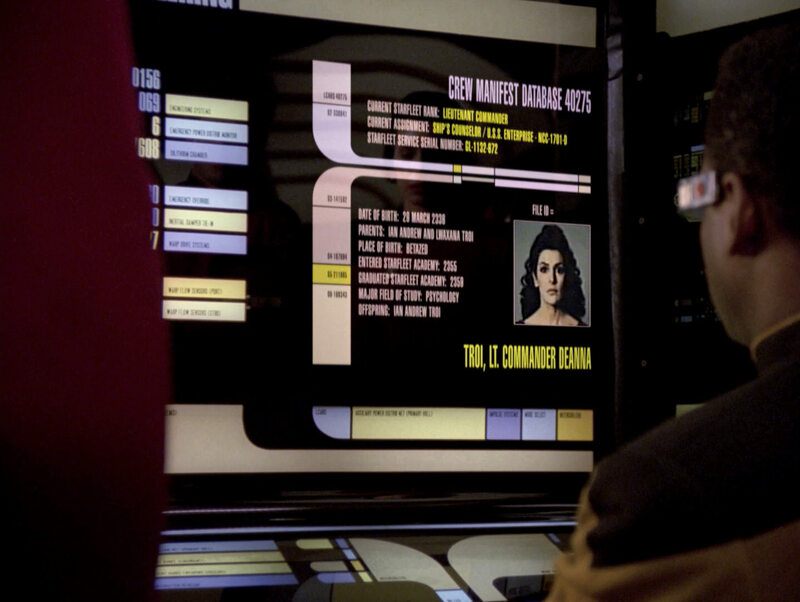 Deanna Troi's father is incorrectly listed as "Alex Troi" in the original version of the episode. 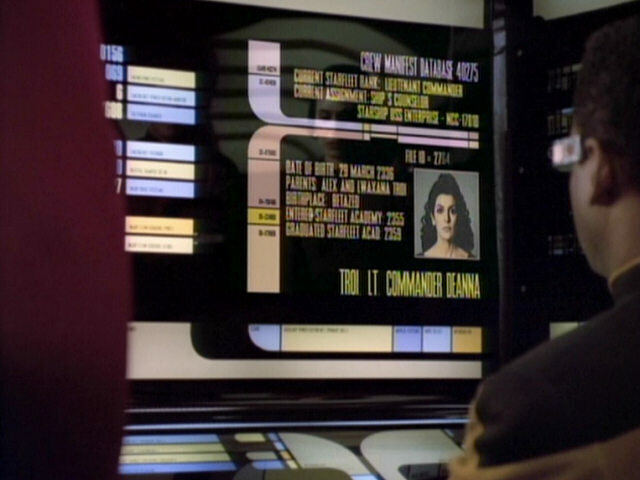 Troi's new file now correctly identifies her father as "Ian Andrew Troi". Two new facts about Troi were added, here major field of study - psychology and her offspring - Ian Andrew Troi. 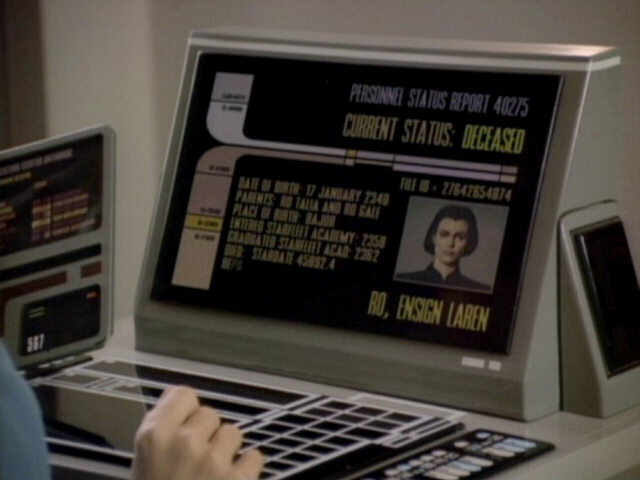 Ro's birthplace is listed as "Bajora" (an early version of the name that was abandoned in favor of "Bajor"). 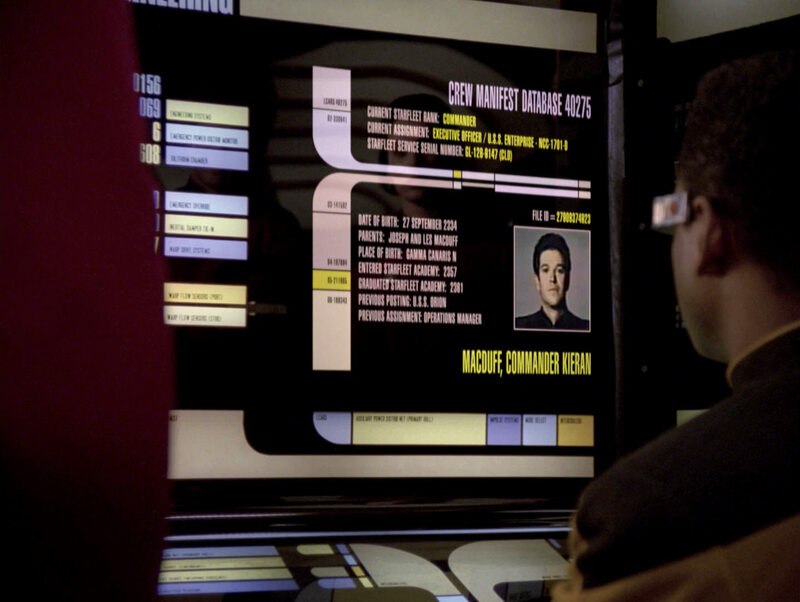 Curiously, according to the original file, Ro spent as many as 6 years at Starfleet Academy, from 2358-2364. "The Next Phase" Her place of birth is now correctly given as "Bajor". 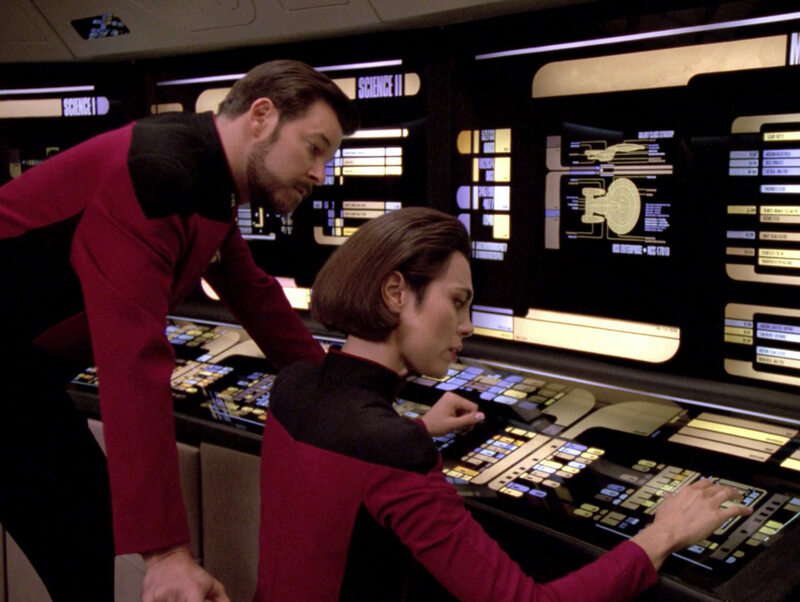 The years on the Academy were fixed to 2358-2362. 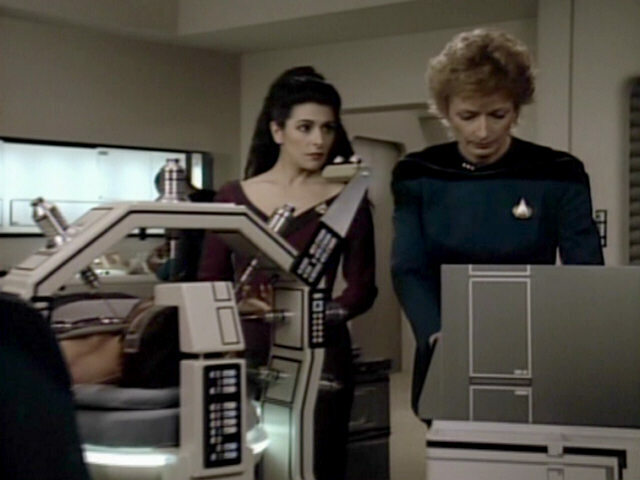 These modifications are consistent with the version of Ro's personnel file, which appeared in the original version of "The Next Phase" later this season. Another new note about Ro Laren reads as follows "Court- martialed for role in Garon II disaster while assigned to the U.S.S. 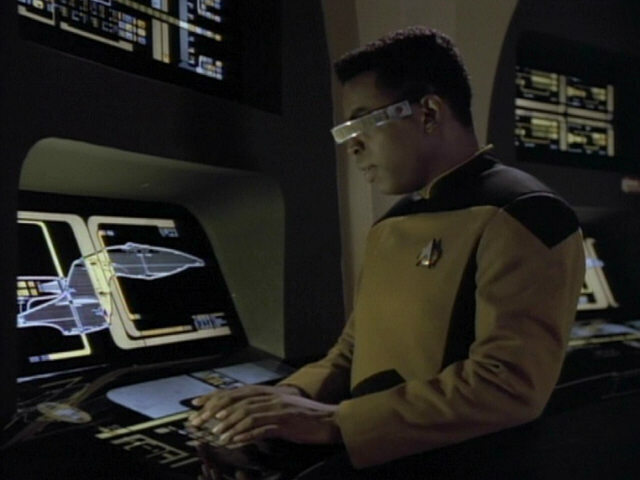 Wellington". 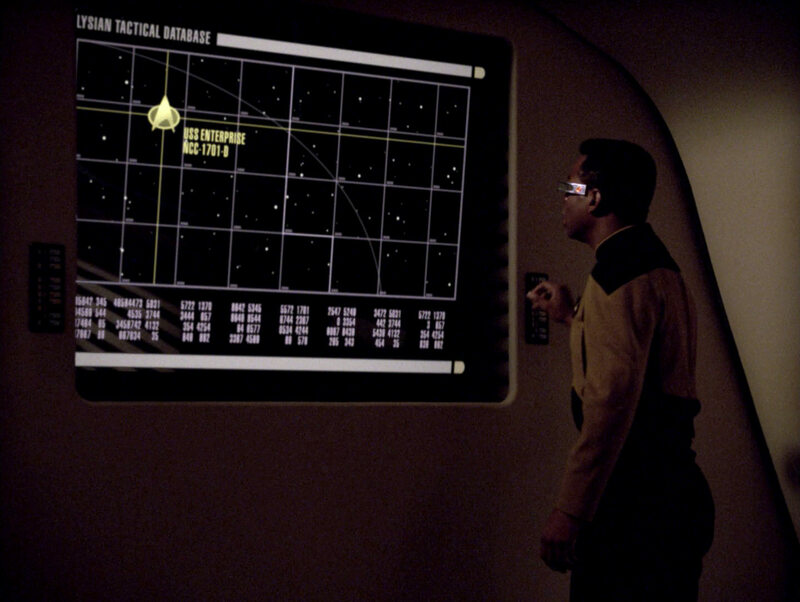 A stellar map showing the locations of the USS Enterprise-D and the Lysian Central Command can be seen here. 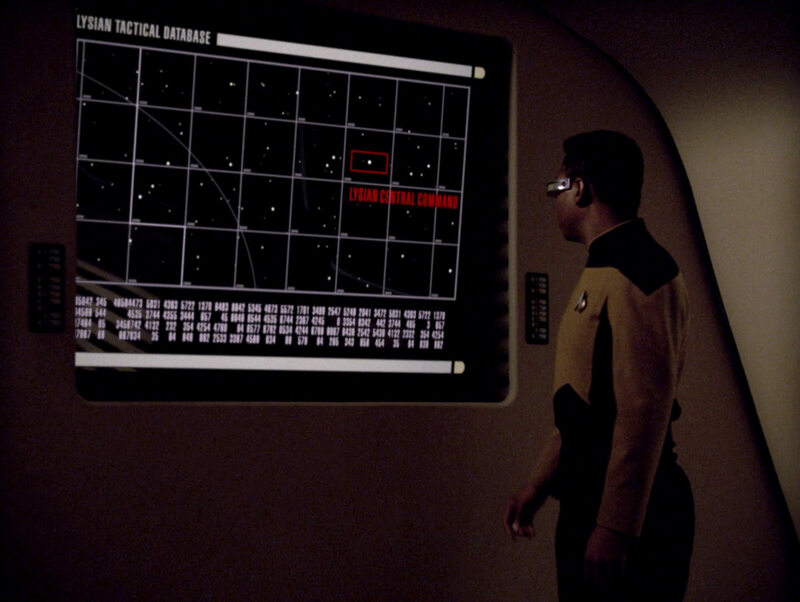 In the remastered version of the episode, the map includes the border of Lysian space. This makes sense, as La Forge says "We've been ordered to cross into Lysian territory" while presenting the map. 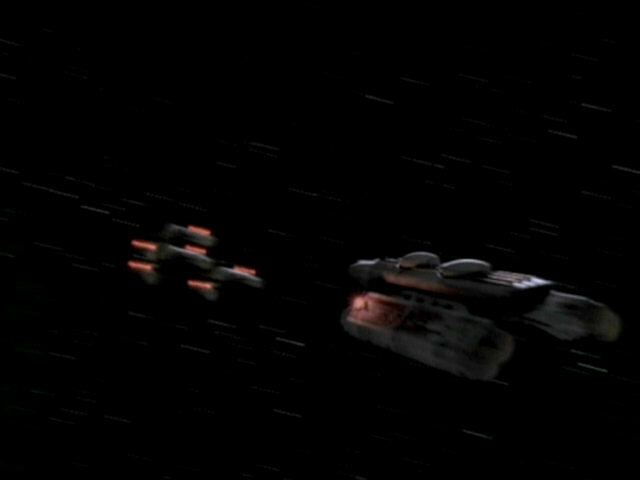 An animated graphic of the Lysian Central Command. 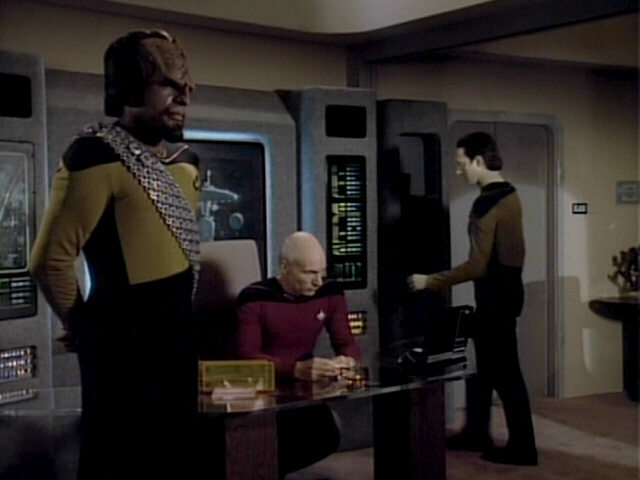 The animation was recreated for the remastering of the episode. 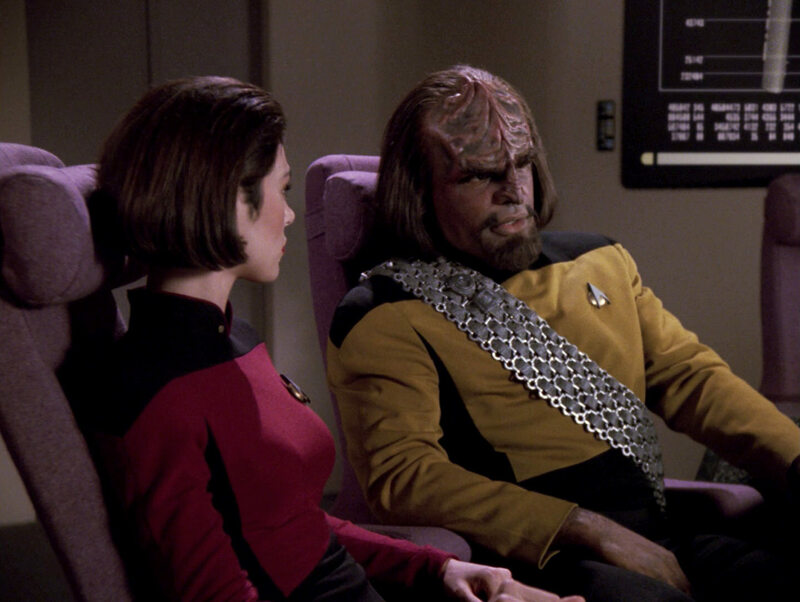 One corner of the graphic is also seen in the medium shot of Worf and Ro. 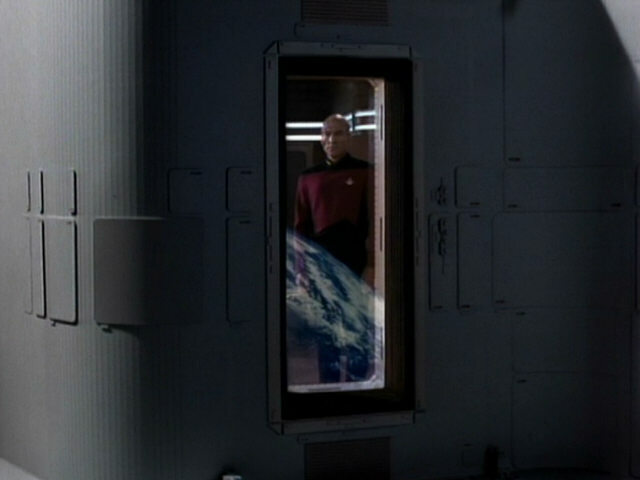 Like in the original version of the episode, the graphic appears static in this shot although the graphic of the station is constantly rotating in the wide shot. 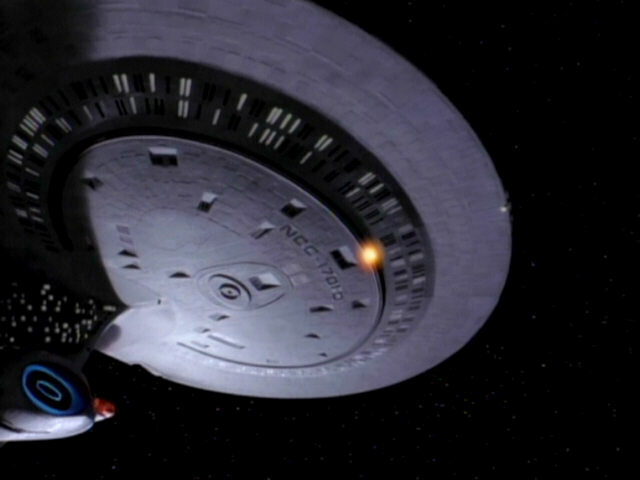 An oft-reused flyby of the USS Enterprise-D. 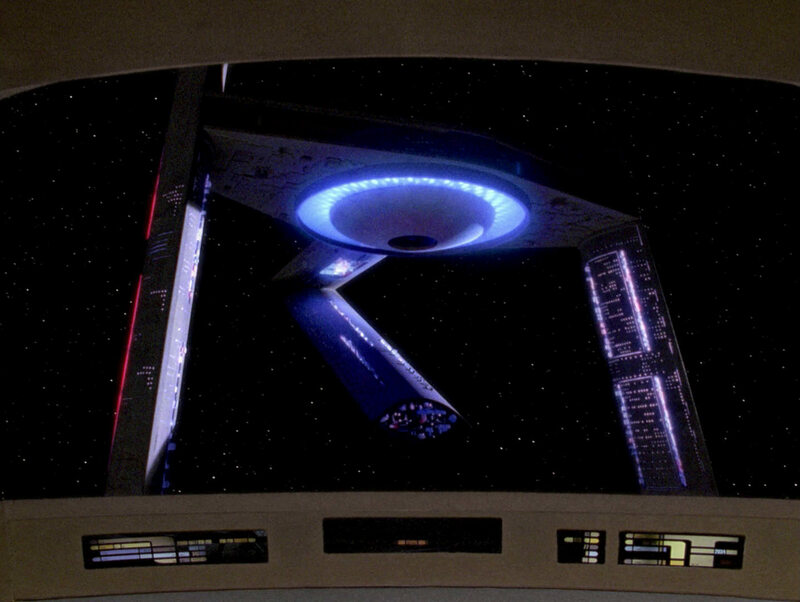 The new warp flyby of the USS Enterprise-D, recreated using a new CG model of this ship, debuts in this scene. 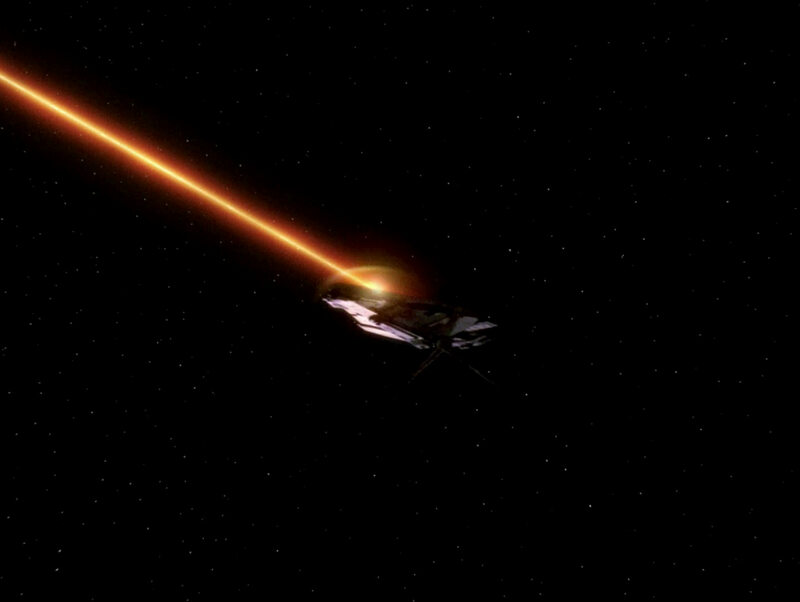 The Lysian destroyer is a re-use of the Talarian warship. 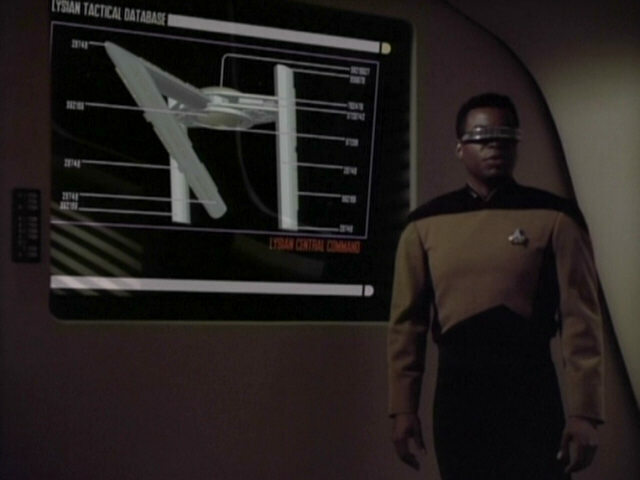 When that model was used in the Qualor surplus depot in "Unification I+II", the four wings were removed. 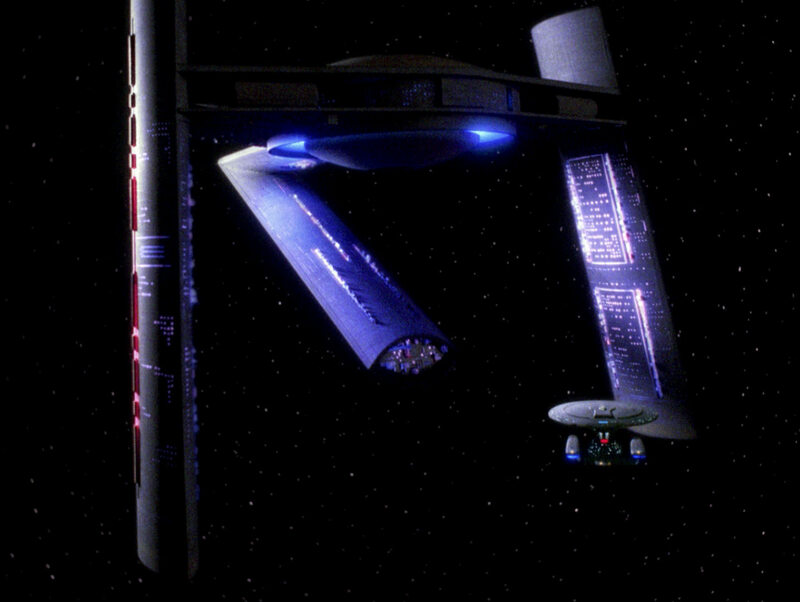 The wings were added for this episode again, but were attached at a different spot, as can be seen when comparing the screenshots. 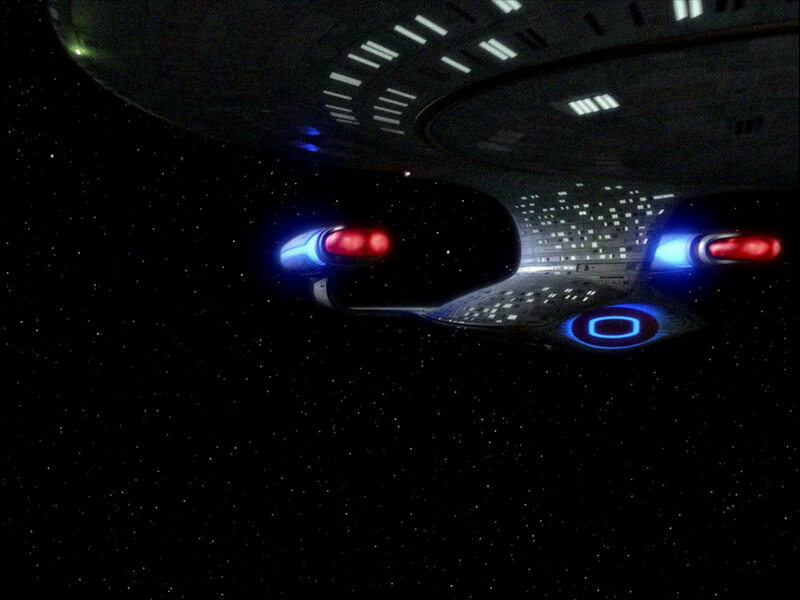 "Unification I" The Lysian destroyer in HD. 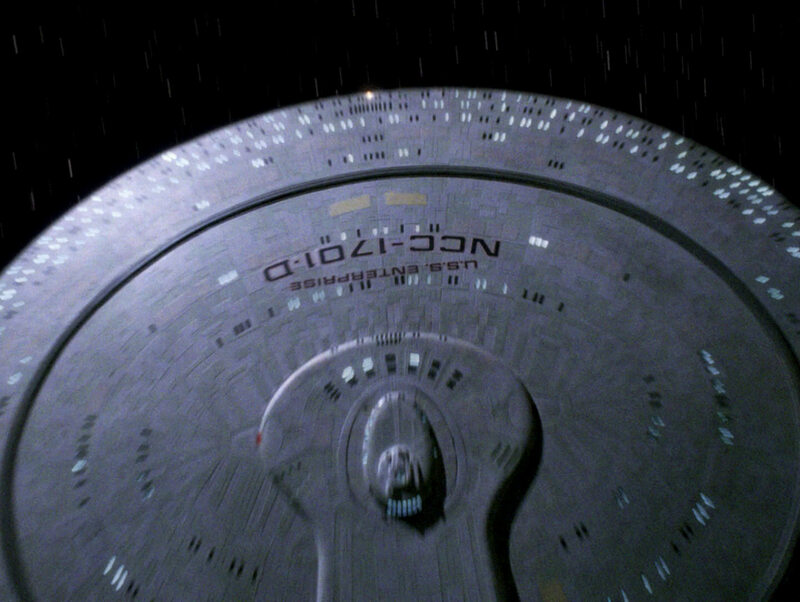 The upper wings (actually the lower wings, as the model appears upside down) are invisible, even with increased gamma. 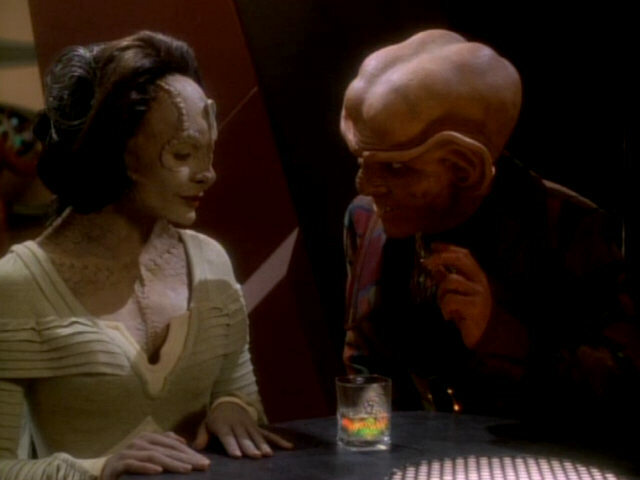 Were they attached at all? 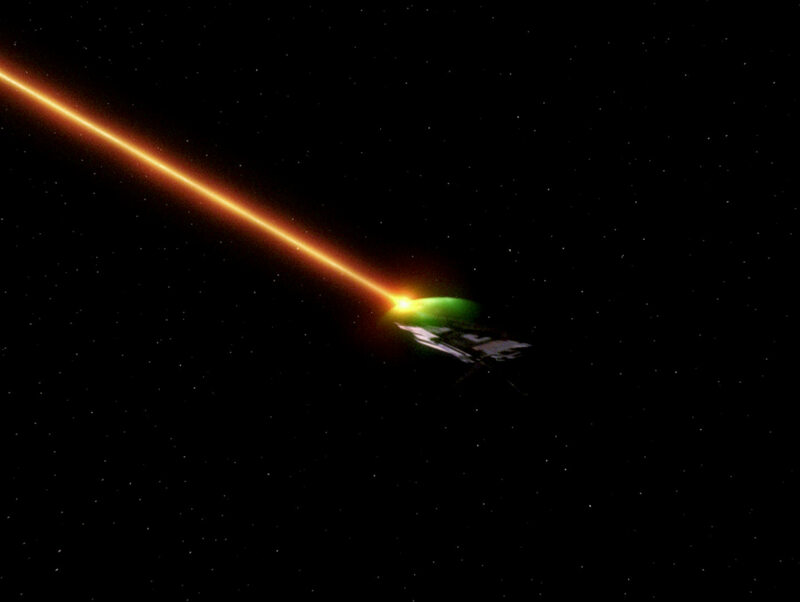 The USS Enterprise-D destroys the Lysian destroyer. 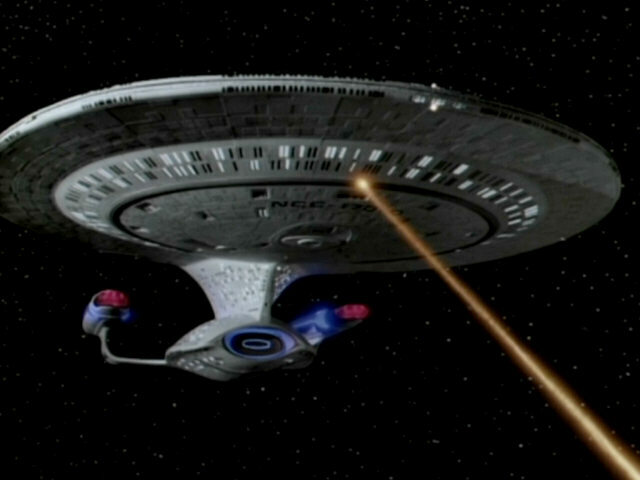 The footage of the Starfleet ship was newly created for this shot. 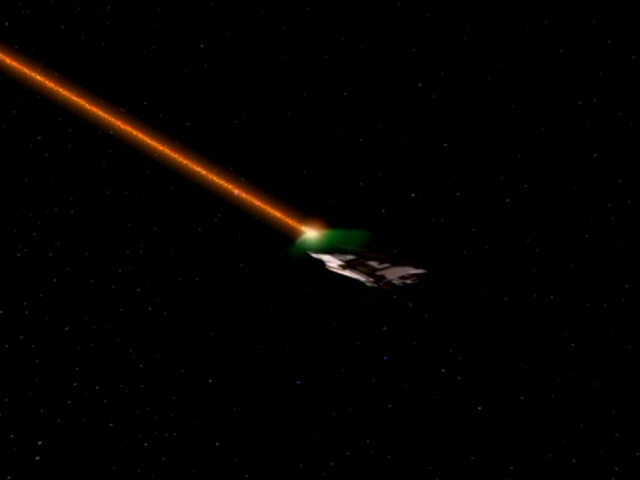 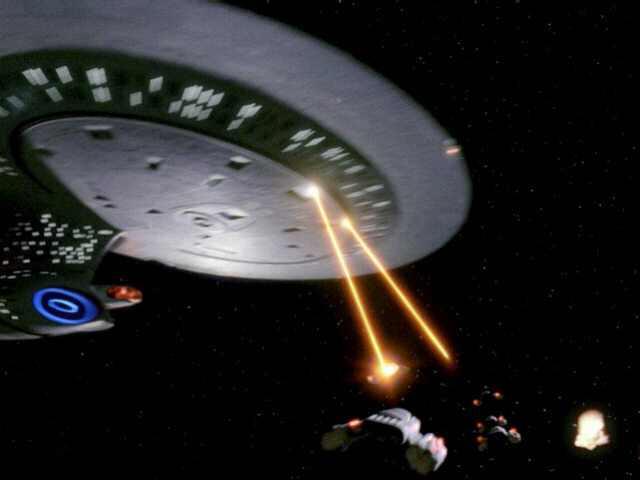 In the sequence, it can nicely be seen how the phaser beam at first is not able to penetrate the deflector shield of the Lysian vessel but after some seconds can cut through the shield bubble. It can again be seen how the wings of the ship are attached differently than in "Suddenly Human". 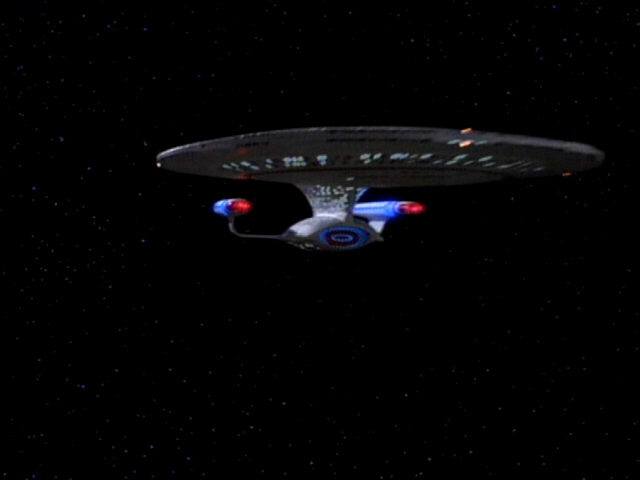 Another reuse of the aforementioned flyby of the USS Enterprise-D, this time at impulse. 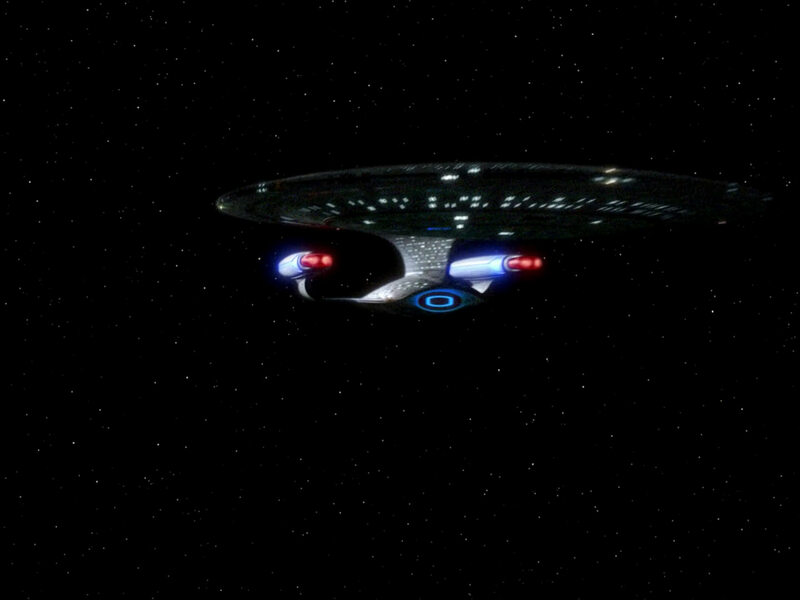 A new impulse flyby using the improved CG model of the USS Enterprise-D debuts in the remastered version of this scene. 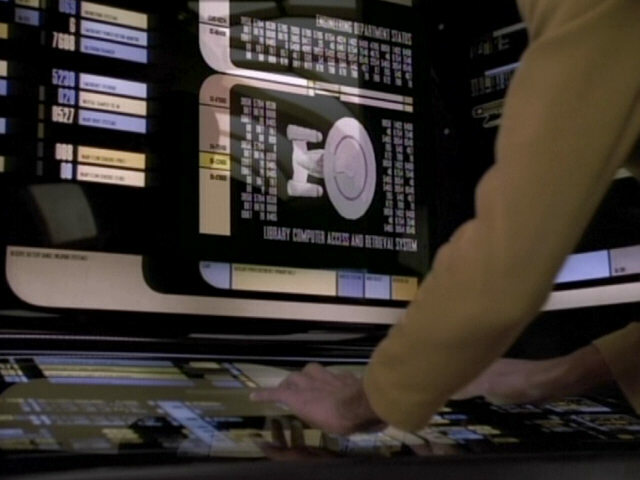 For an unknown reason, this console is attached to the "pool table" in main engineering in this one scene. 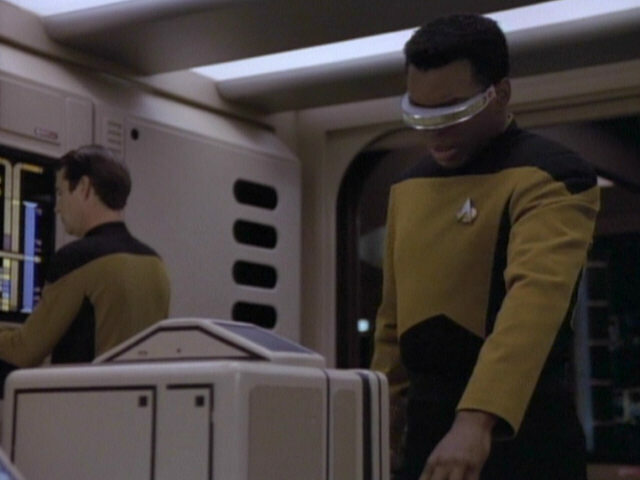 The console was first seen in "The Mind's Eye" were it is part of a weapons testing range. 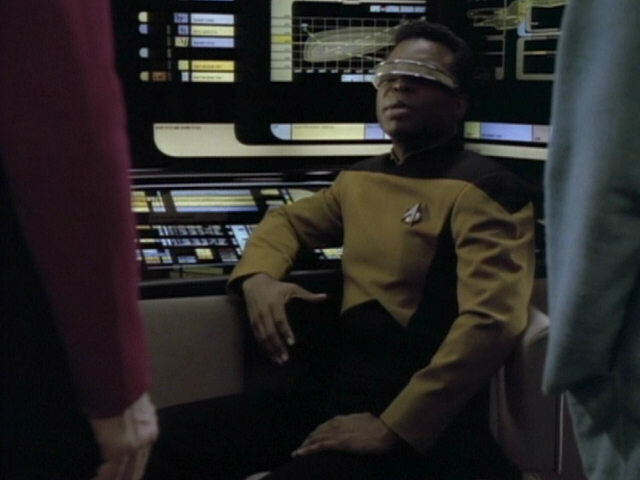 It was also standing on the main engineering console in "The Game". 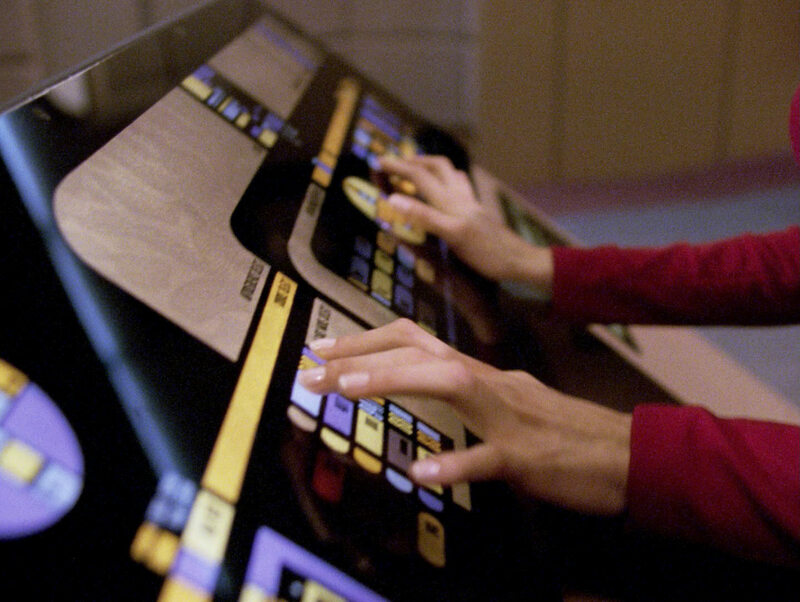 "The Game" The boxy console in HD. Data checks several files on an engineering monitor. 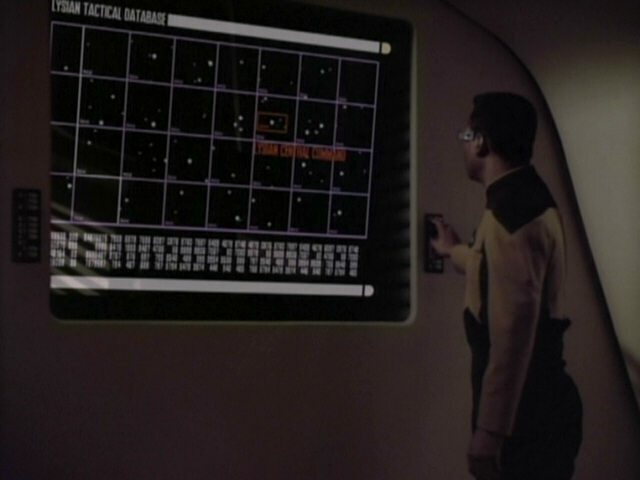 In the original version of the episode, the first page mostly consists of random numbers. 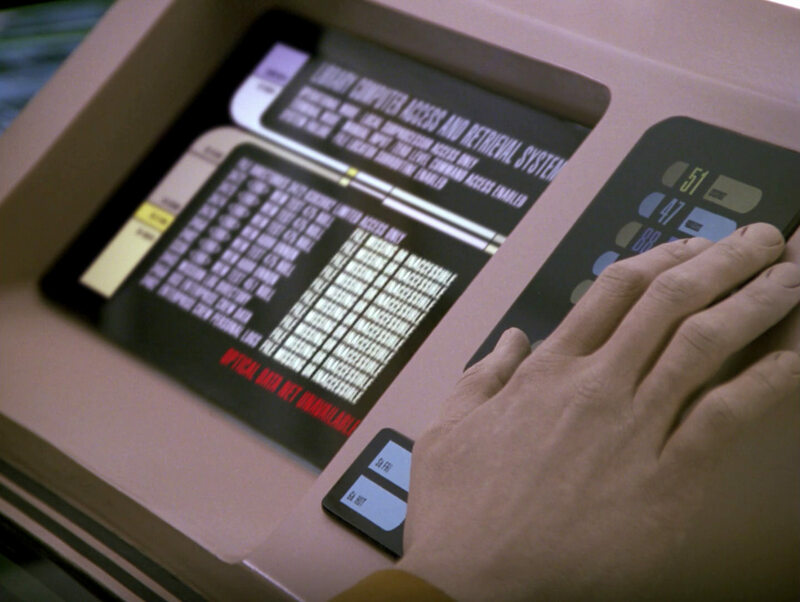 The reconstructed first screen in the remastered version still consists of random numbers. 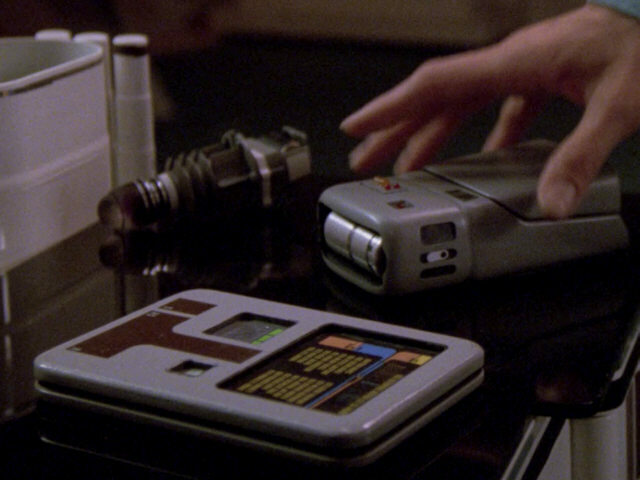 The desk in Riker's quarters contains some noteworthy artifacts. 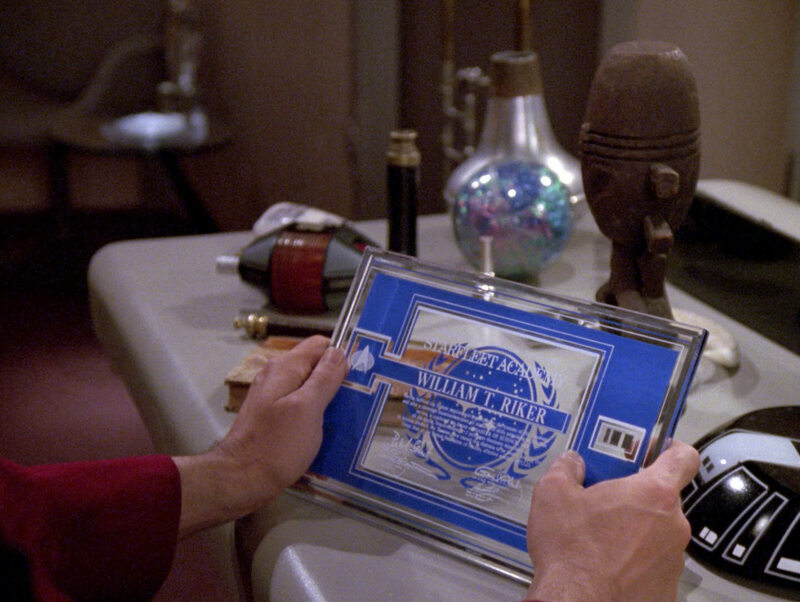 His Starfleet Academy graduation diploma was previously glimpsed in his quarters in "The Icarus Factor" and is similar to Data's diploma seen in "The Measure of a Man" and Picard's diploma seen in "Pen Pals". 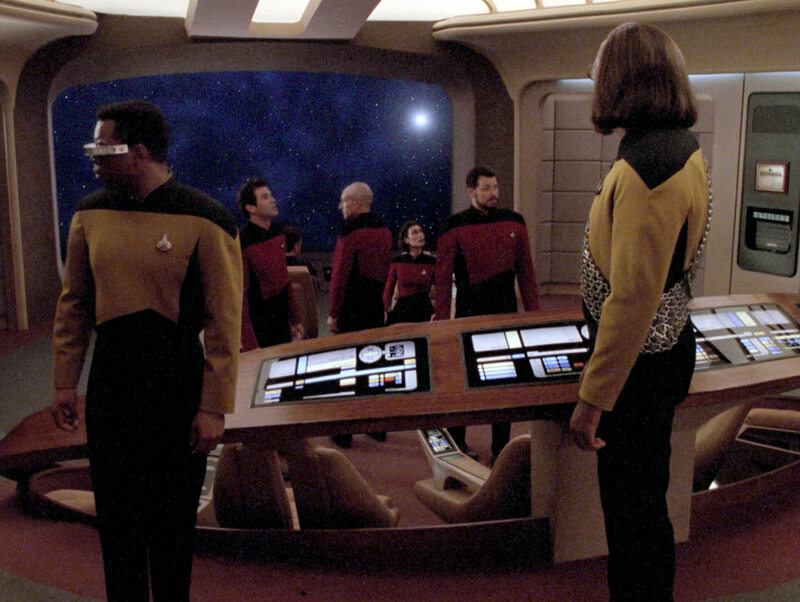 of a Man" HD In HD, it can be seen that one of the people having signed the diploma is one "Gene Roddenberry". 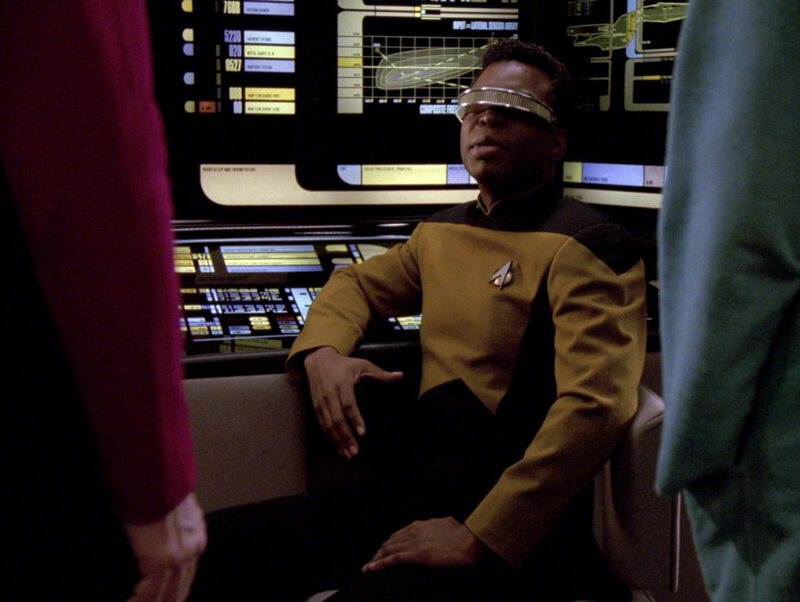 The words "Master of Science" can also be read now. 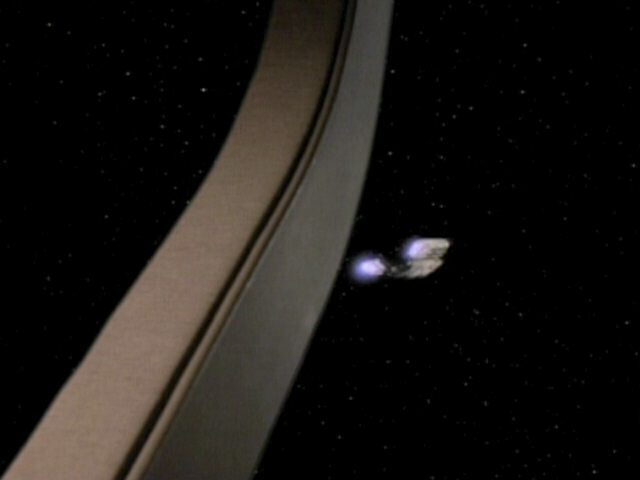 The small device behind the diploma was identified as a superconductor magnet (SCM) model 3 in "The Dauphin". 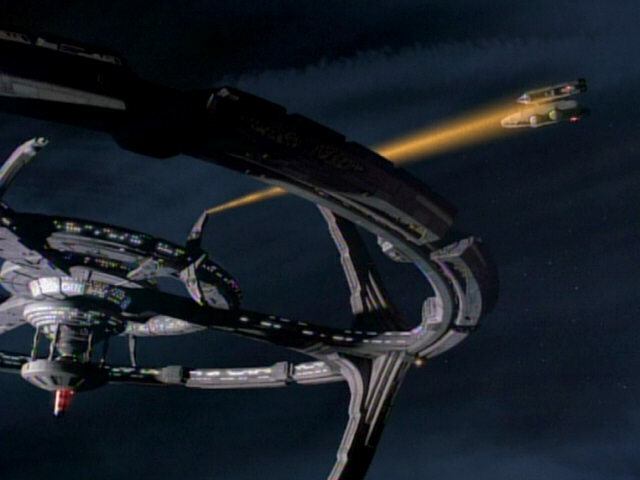 In the Voyager episode "Prime Factors" it was reused as the Sikarian spatial trajector. 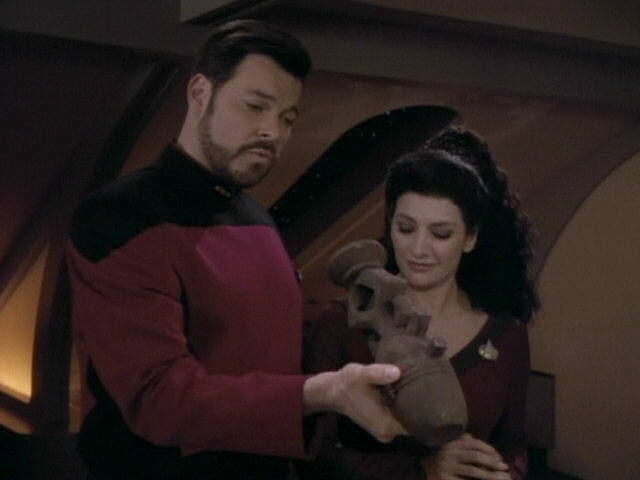 A horga'hn (surely the one given to Riker by Picard after his trip to Risa in "Captain's Holiday") was last seen in Riker's quarters in an illusion created by the alien boy Barash. 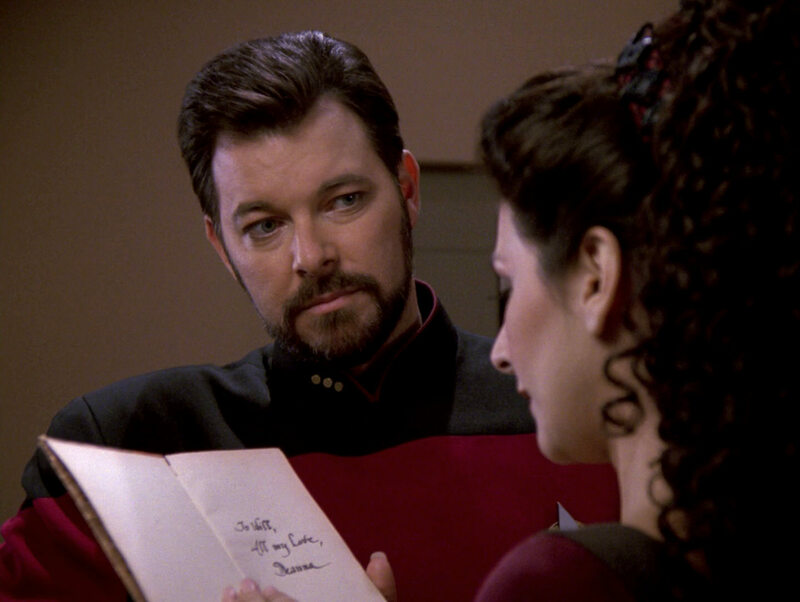 Troi looks at the dedication in Riker's copy of Ode to Psyche. 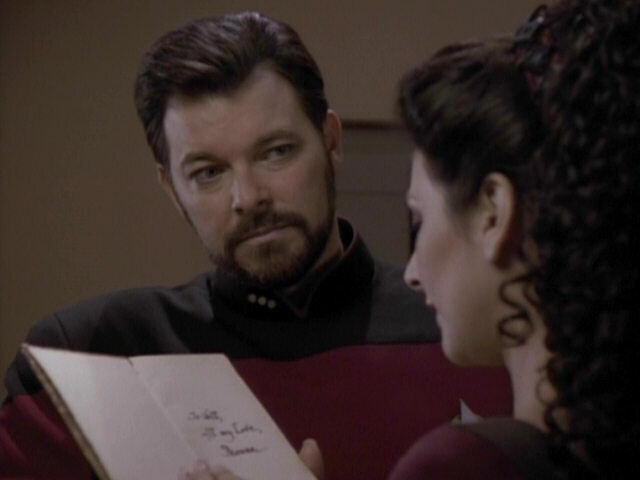 The dedication "To Will, all my love, Deanna" can be read much better in HD. 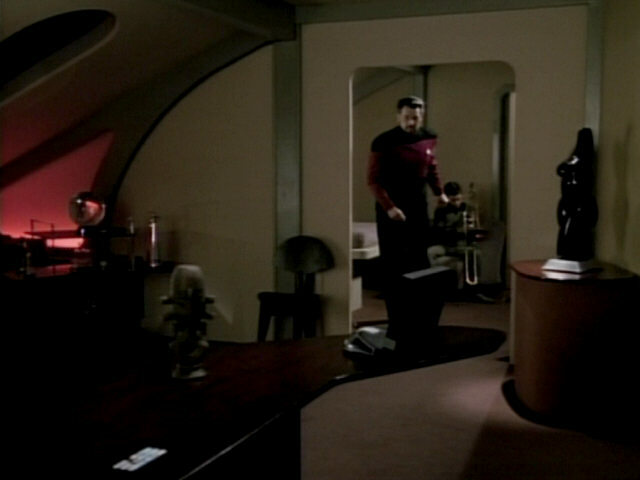 The senior officers' quarters set is seen as three separate quarters in this episode. 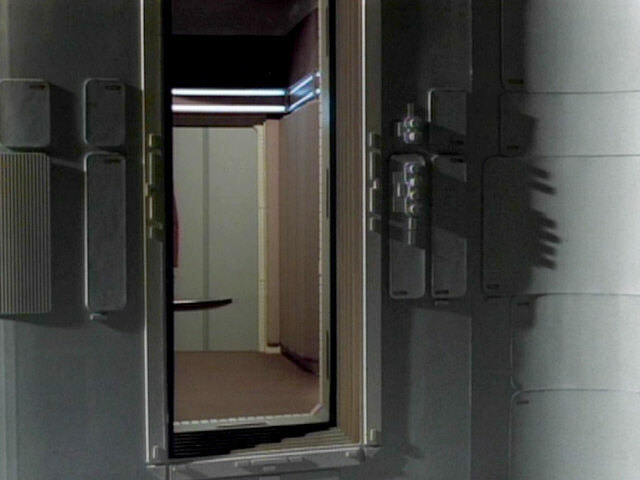 It first appears as Troi's quarters, then as Riker's quarters (seen here) and finally as MacDuff's quarters a little later in the episode. 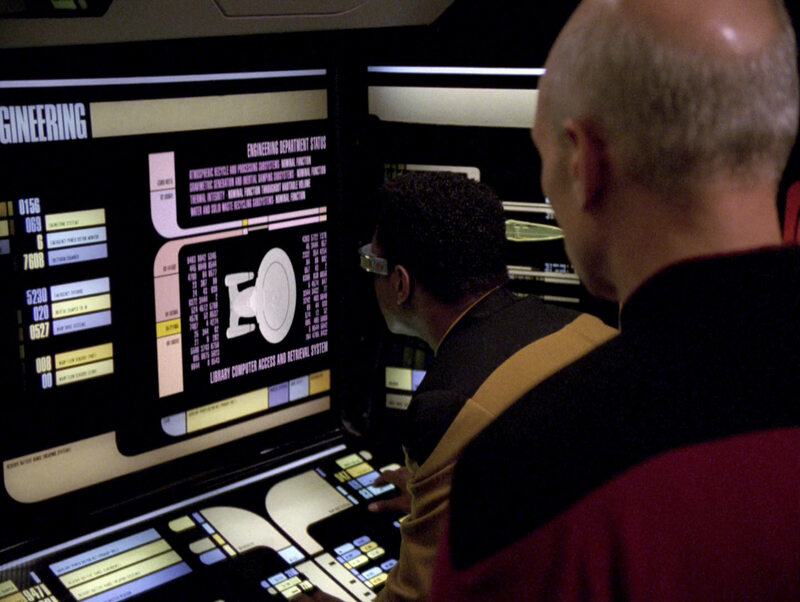 To distinguish between the various redresses of the set, the lighting under the windows is changed. Whenever the set is redressed as Troi's quarters, the lights are pink, when it is redressed as Riker's quarters, the lights are orange. 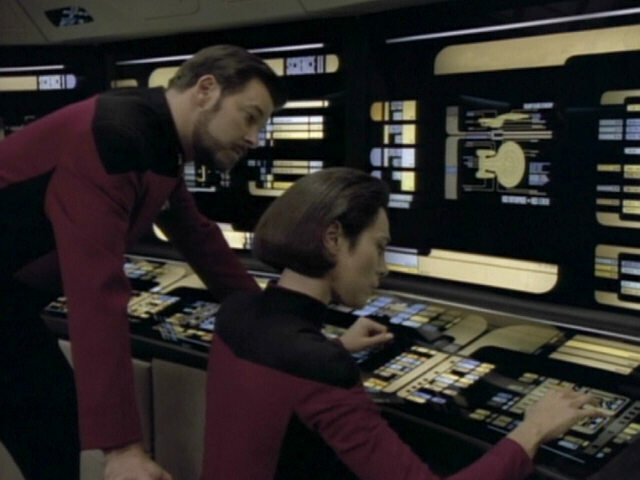 In the case of MacDuff's quarters, the lights are red, a color that is usually not used. Though there is less consistency in the captain's case, the lights are usually blue in Picard's quarters, as seen in this screenshot from "The Perfect Mate". 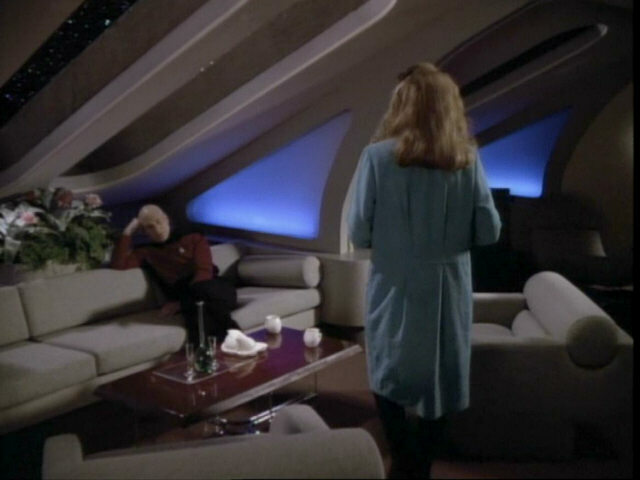 It seems no color was agreed on for Crusher's quarters as the lights have appeared yellow, purple, light and dark blue, pink and orange in various episodes. 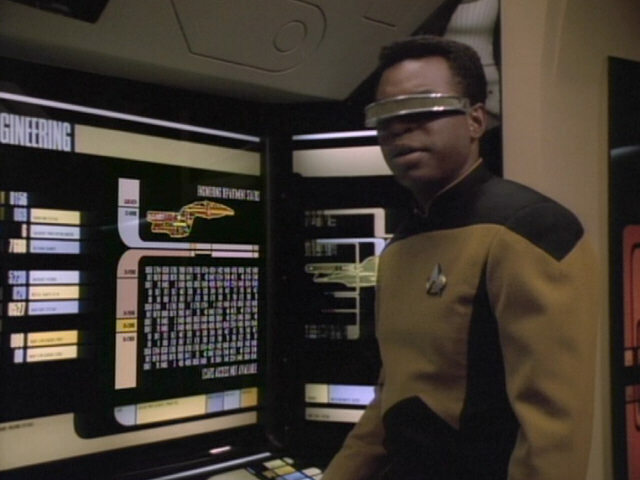 The graphic behind Geordi was originally seen in "Silicon Avatar" and appears unchanged here. 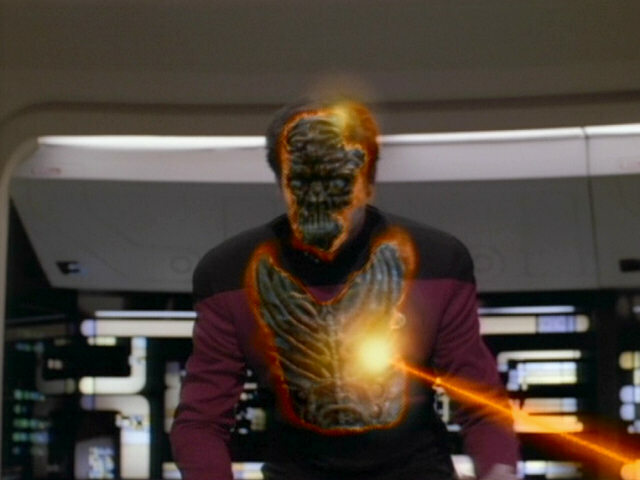 "Silicon Avatar" The graphic in HD. 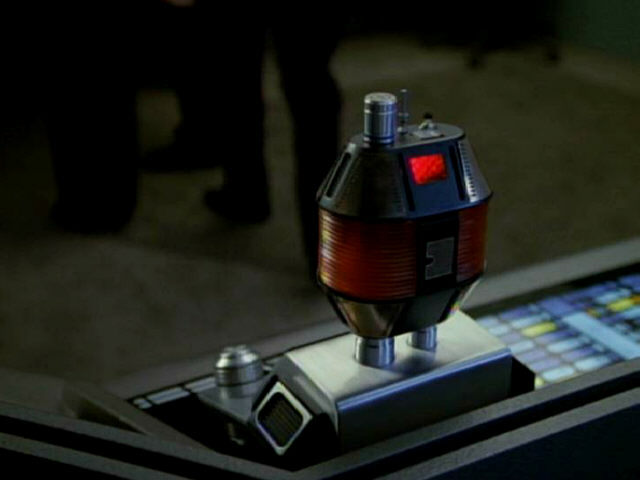 The medical device Crusher uses when she tries to restore MacDuff's memories was originally part of a similar device she used in "Shades of Gray". 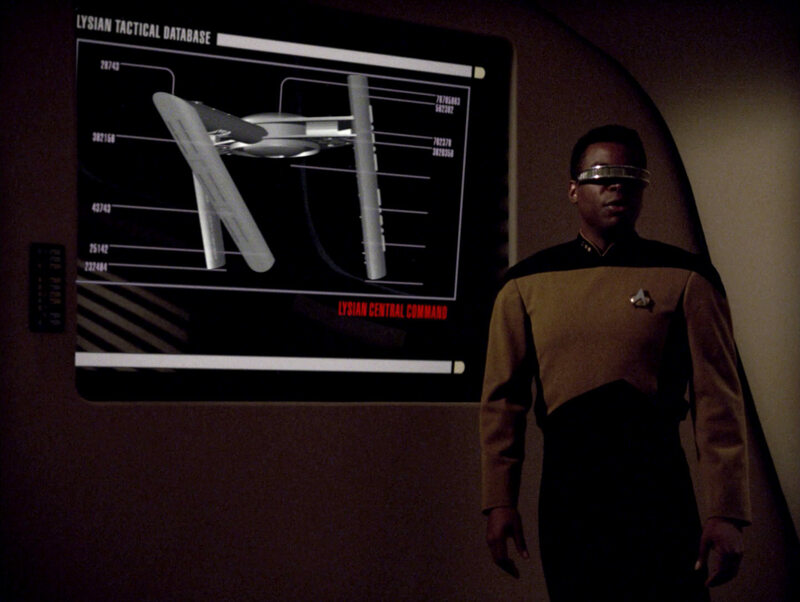 The prop was last seen in the medical lab in "Transfigurations". 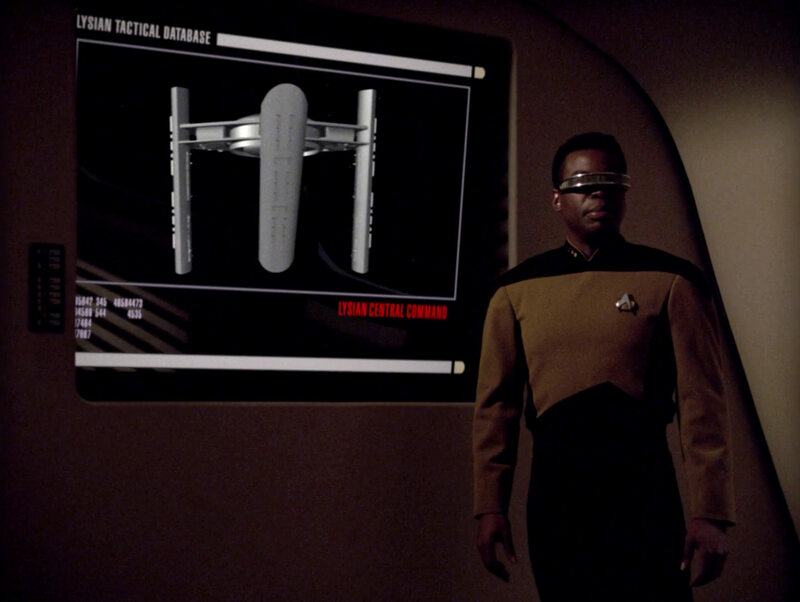 "Transfigurations" The device in HD. 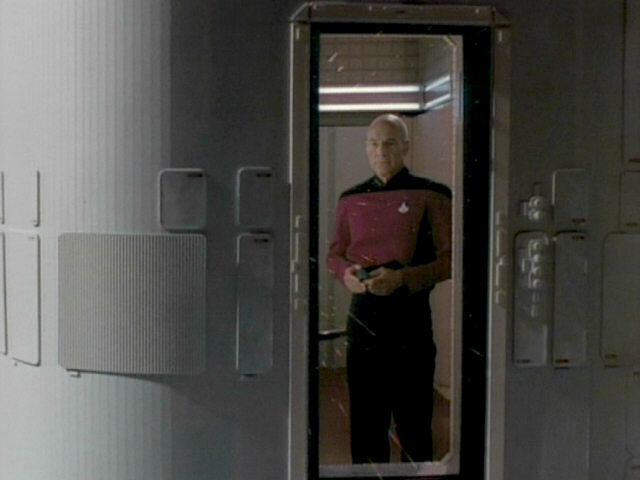 "Conundrum" is the last of four episodes in which Picard's ready room window is seen from the outside. 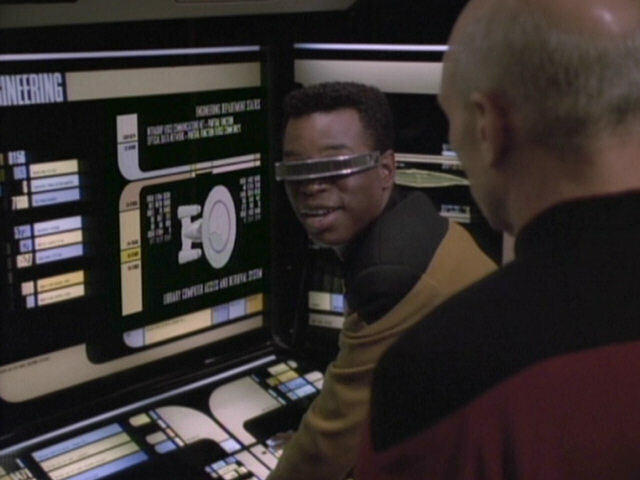 The other episodes are "Coming of Age", "The Best of Both Worlds II" and "Darmok". 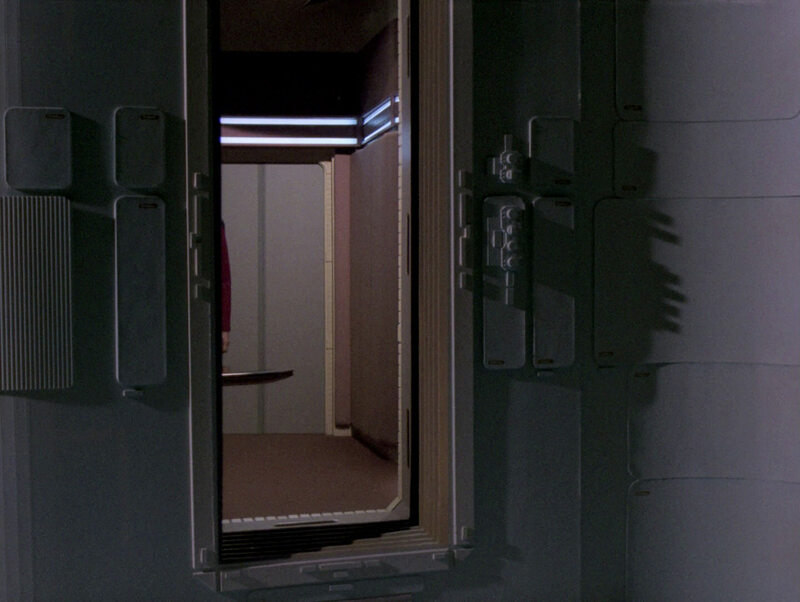 In the last three appearances, the same miniature hull wall was composited into the scene in post production. 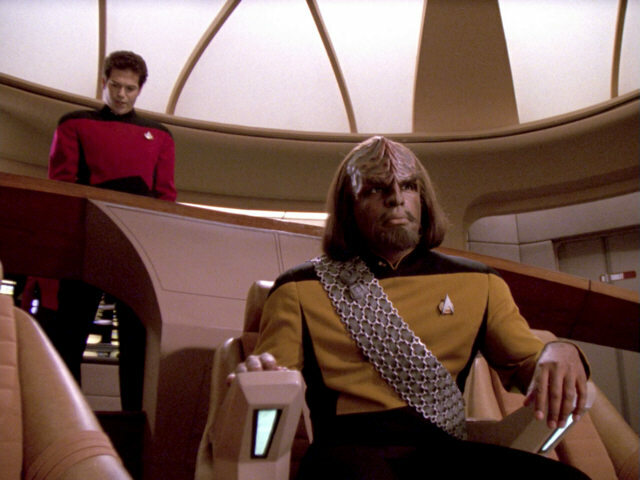 "Darmok" A good look at the set in HD. 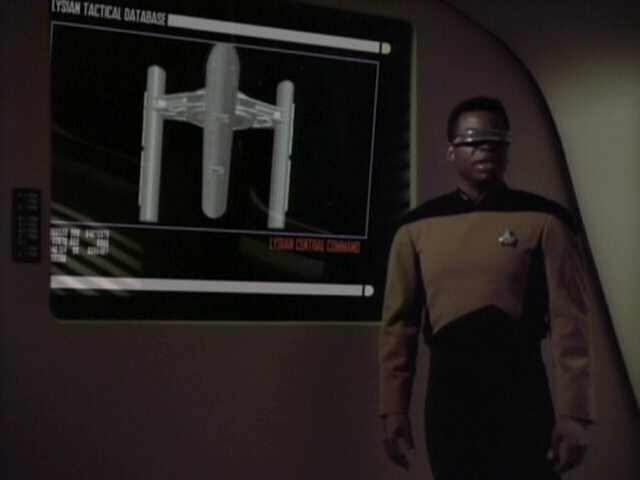 In the early season 5 episodes "A Matter of Time" and "Violations", the wrong replicator LCARS display was seen. 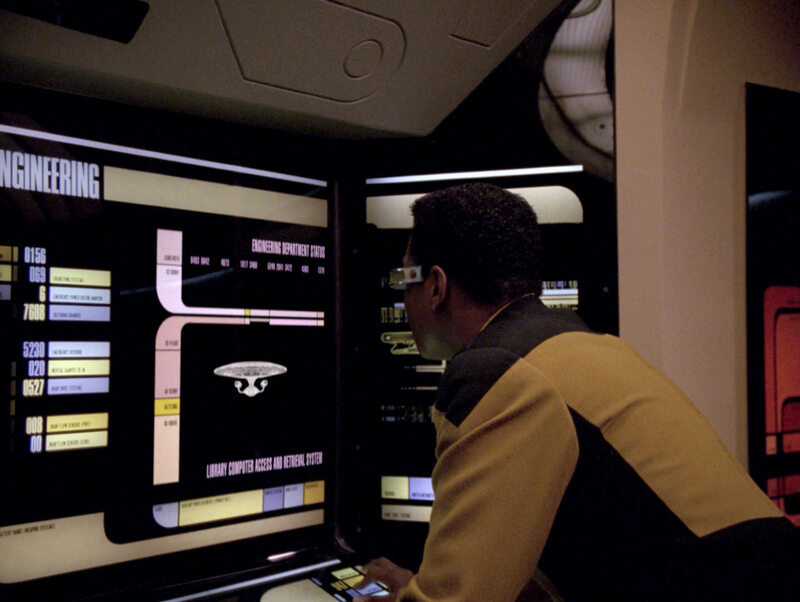 As the set piece was used in Kirk's quarters aboard the USS Enterprise-A in "Star Trek VI: The Undiscovered Country", the 24th century LCARS display was replaced by a 23rd century one. 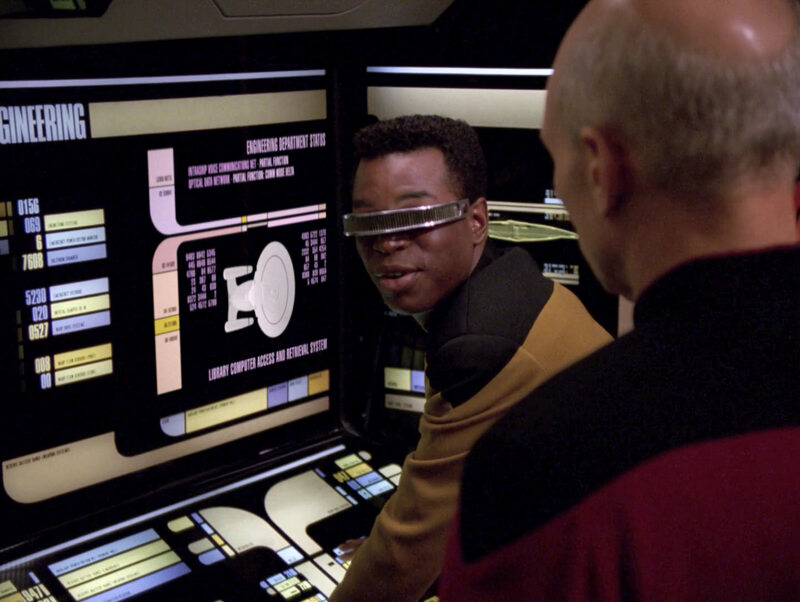 When the replicator was returned to the TNG sets in season 5, it was forgotten to switch back to the correct LCARS display. 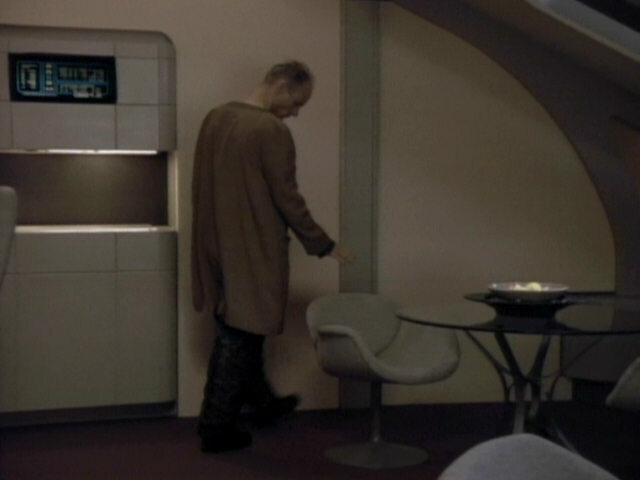 This mistake has finally been fixed for this episode. 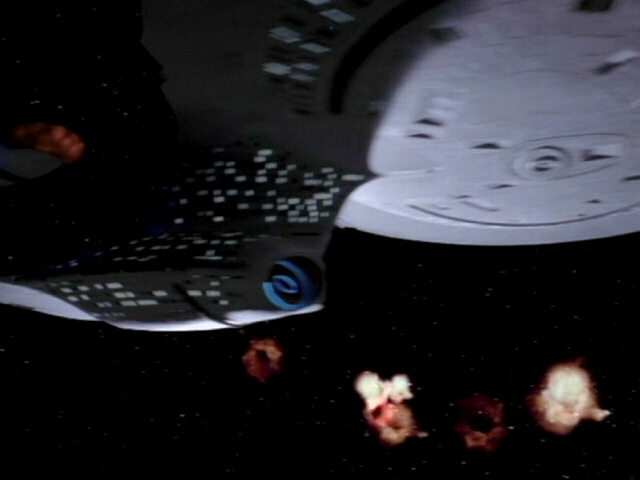 The Lysian sentry pods are destroyed by the USS Enterprise-D. 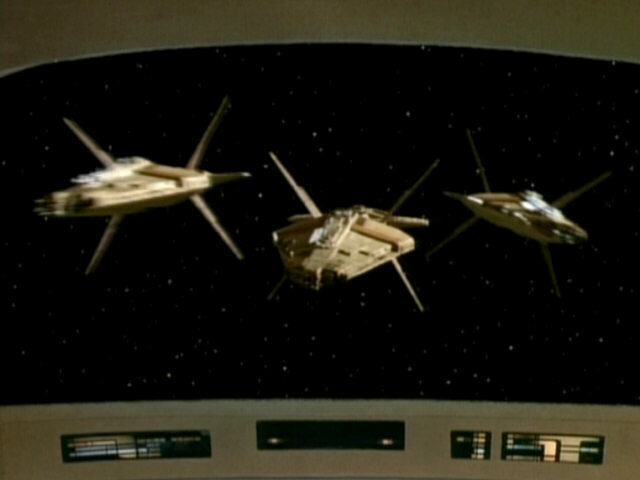 The model of the small ships was later re-used in "Starship Mine" as the terrorist ship and as the Ekina in "Invasive Procedures". 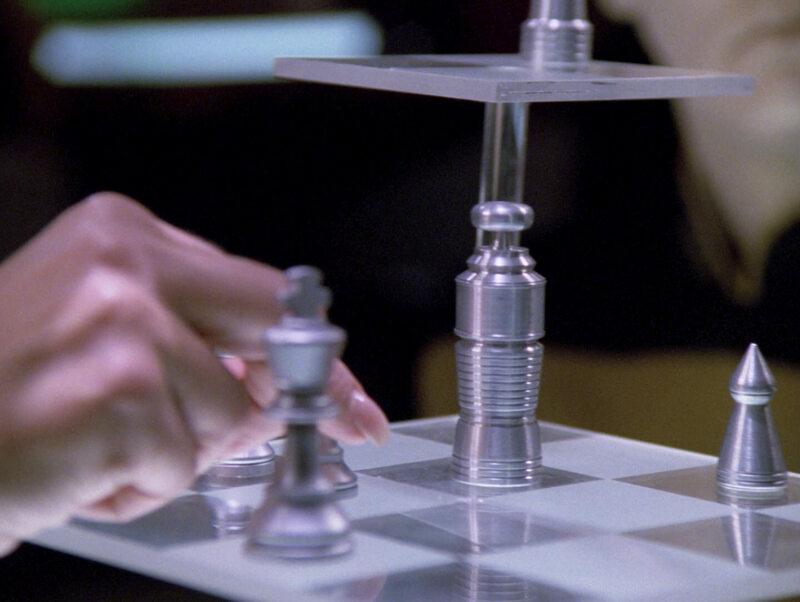 In both re-uses, the model was turned upside down. 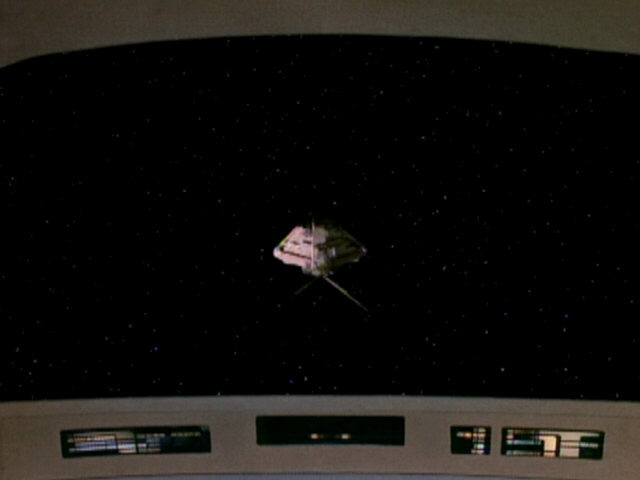 As in the following scene, the footage of the USS Enterprise-D was newly filmed for this episode. 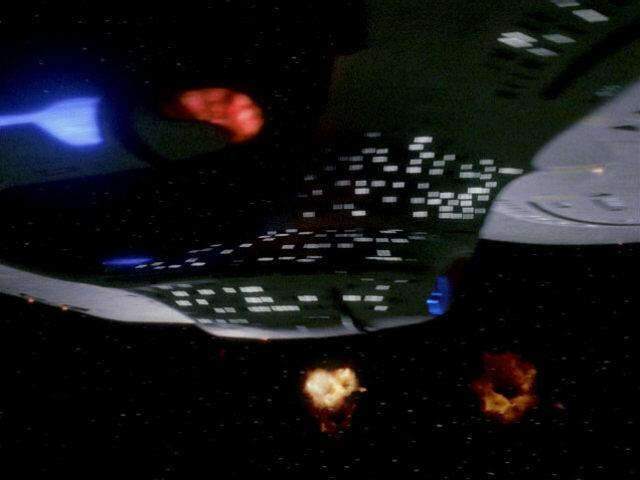 "Starship Mine" The sequence as it appears in TNG-R (still with considerable motion blur). 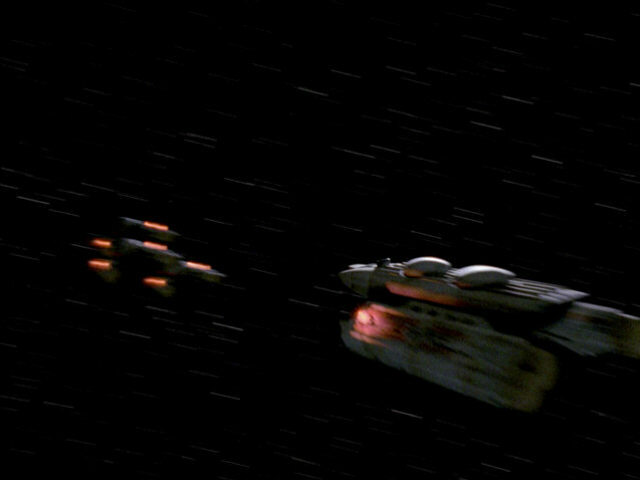 The enormous size of the Lysian central command can be nicely seen in these two shots. 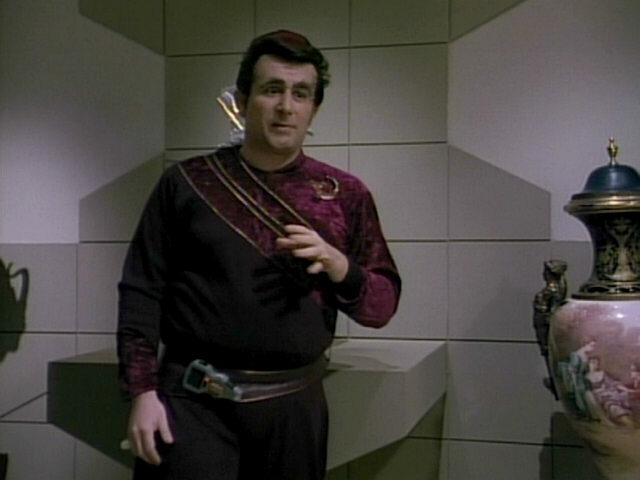 The model is a re-use of the Edo god created all the way back for the first season episode "Justice". 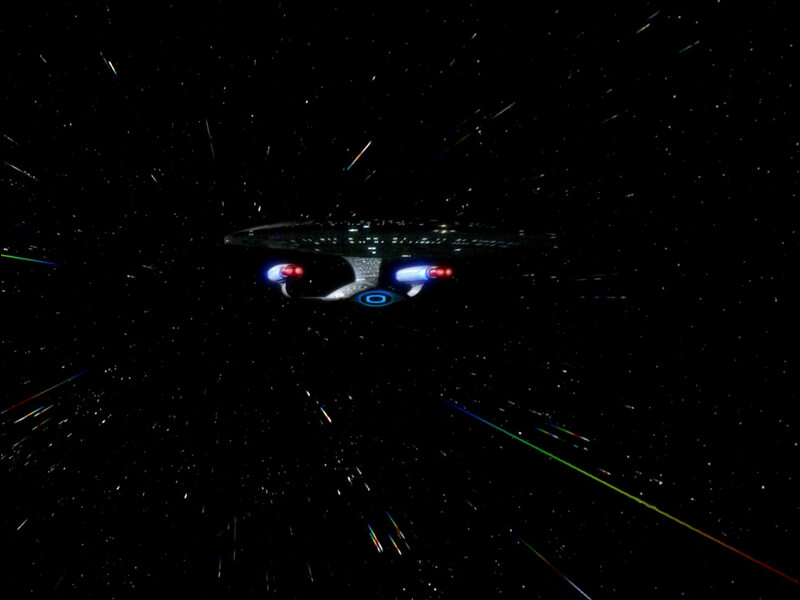 "Justice" The approach of the Enterprise in HD. 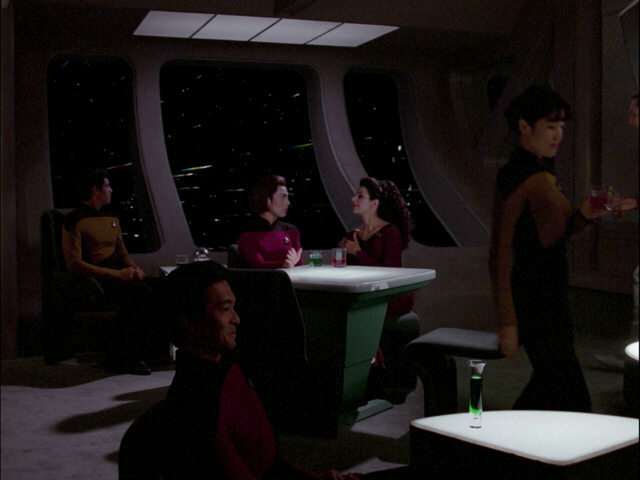 The true appearance of the Satarran posing as Keiran/Kieran MacDuff can be seen in these two FX shots. 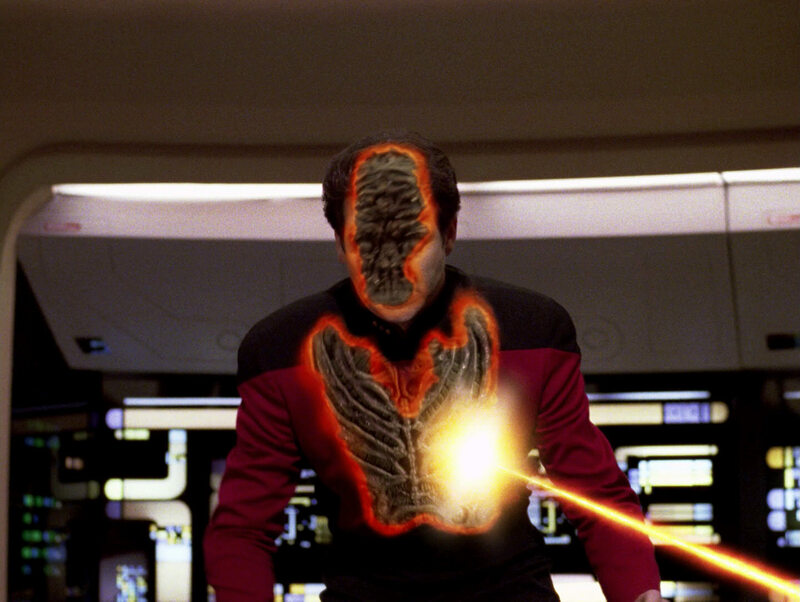 A head and torso of the Satarran was created by Michael Westmore and the footage of the alien was carefully inserted into the live action footage in post production. 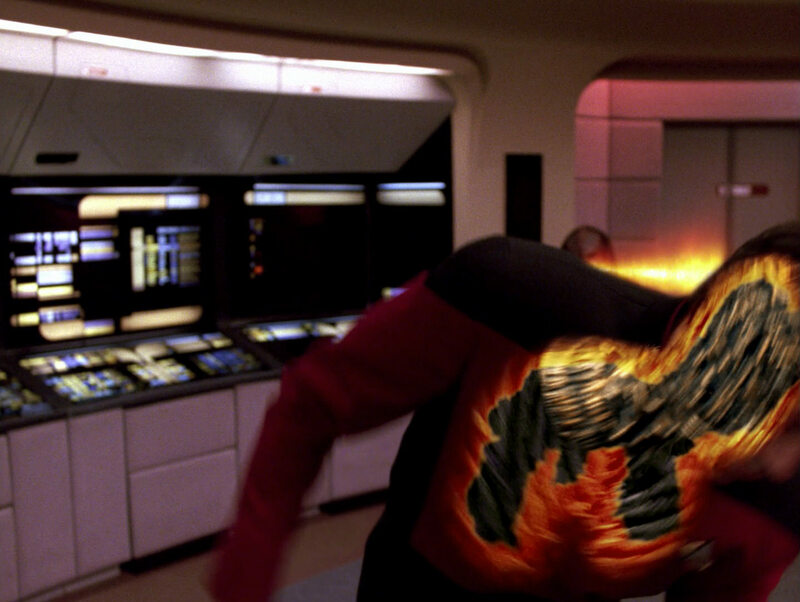 The effect was reconstructed for TNG-R. 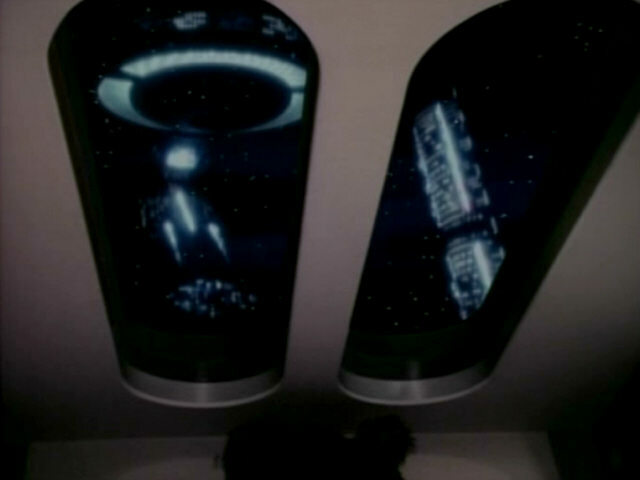 The streaking stars in the Ten Forward windows this scene were added in post production, which explains why the footage appears a little blurry. 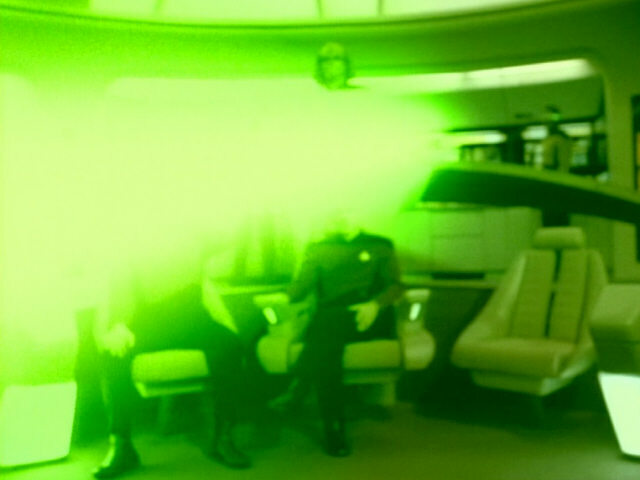 The blurriness is gone in TNG-R (except for the usual noise in dim scenes). 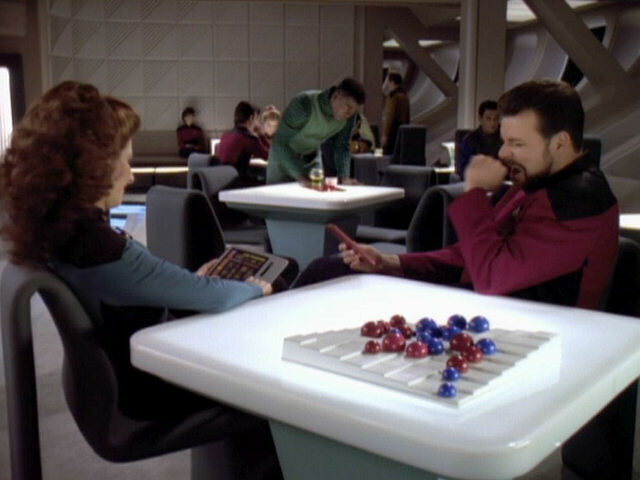 Two versions of the board game Terrace, one featuring black and white playing pieces, one featuring pieces in red and blue, can be seen on two Ten Forward tables in the final scene of the episode. 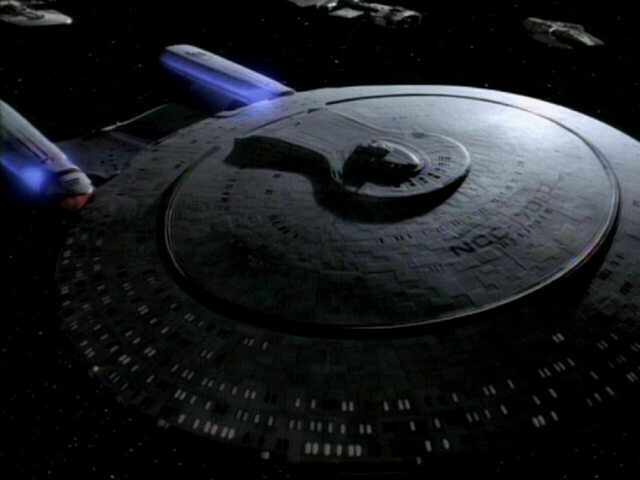 The games were added as Ten Forward set dressing in the fifth season. 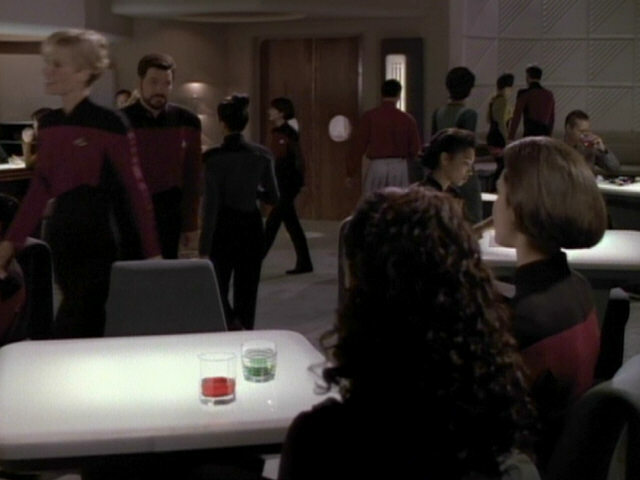 They first appeared in the background in "Hero Worship" and so far had also been seen in "Violations". 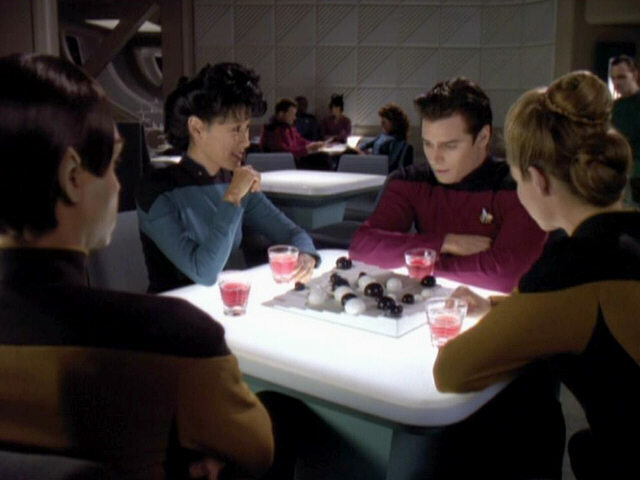 The Terrace games would be part of the Ten Forward set dressing until the end of the series but received most screen time in "Lower Decks".